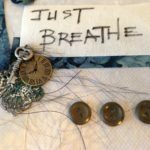 I get asked occasionally how I hang my art quilts on my walls so I thought I’d make a little post about it. If you have any questions, please feel free to ask. Next one I make I will take some extra photos showing more details. 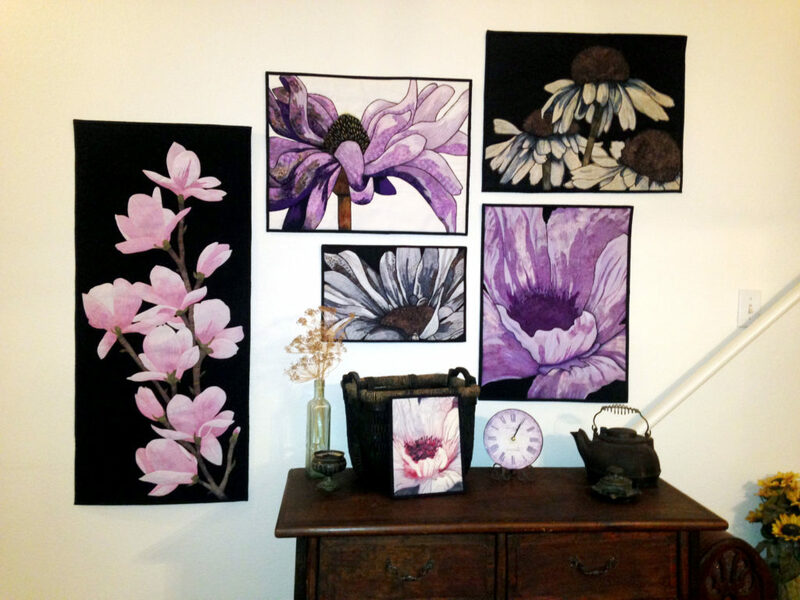 There are lots of options when it comes to deciding how to hang an art quilt. For many years I just used Command Strips. 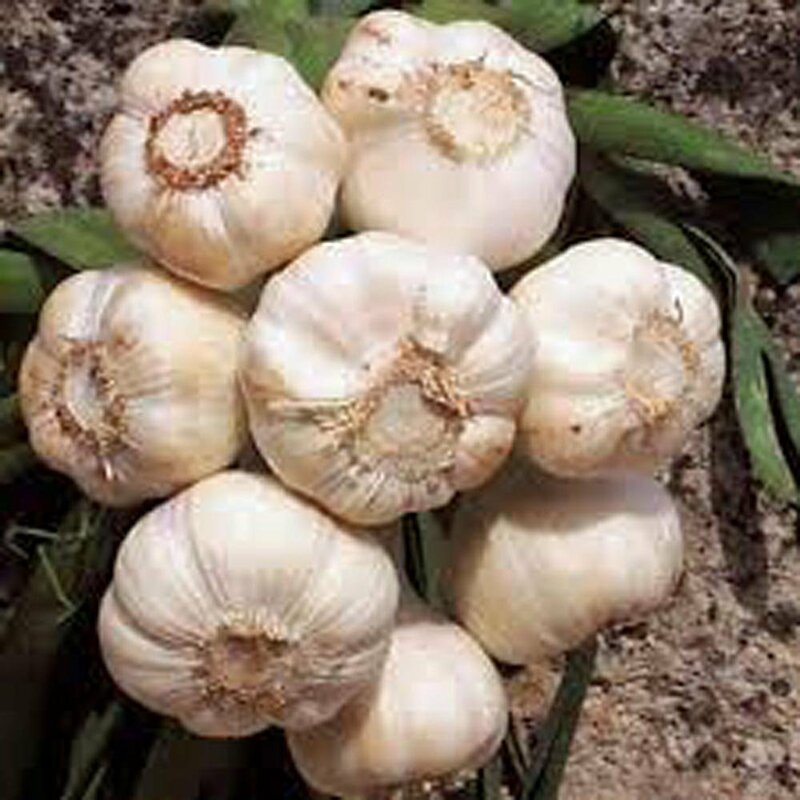 But living in a very very dry climate, they only last about a year or so and loose their stickiness. Which suited me fine as I’m always changing up what I have on my walls. But, I really should have a more permanent way to hang. 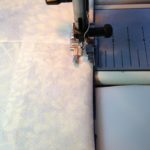 I had made hanging sleeves the traditional way for previous quilts, but seemed over board for these smaller art quilts and I don’t like the bulk of a rod at the top or how the round rod curls the top of the quilt if too large of a rod. 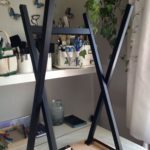 Then it hit me one day as I was using a wooden yardstick to measure out an area on my design wall… “Why not use this instead of a wooden or metal rod to hang? !” It’s flat, cut to size easily and readily available in any home improvement store… CHEAP! like 79 cents cheap! And I just so happen to have a bunch of them I got for a little project I had not done yet. Now…. how to make a sleeve better. Really only need the corners. Thought about just two loops on the back, but had seen someone put triangles into the corners before also. Faster and more secure IMO plus you would never see the wood from the front or side. It’s so simple and is attacked during the binding portion of the quilt. 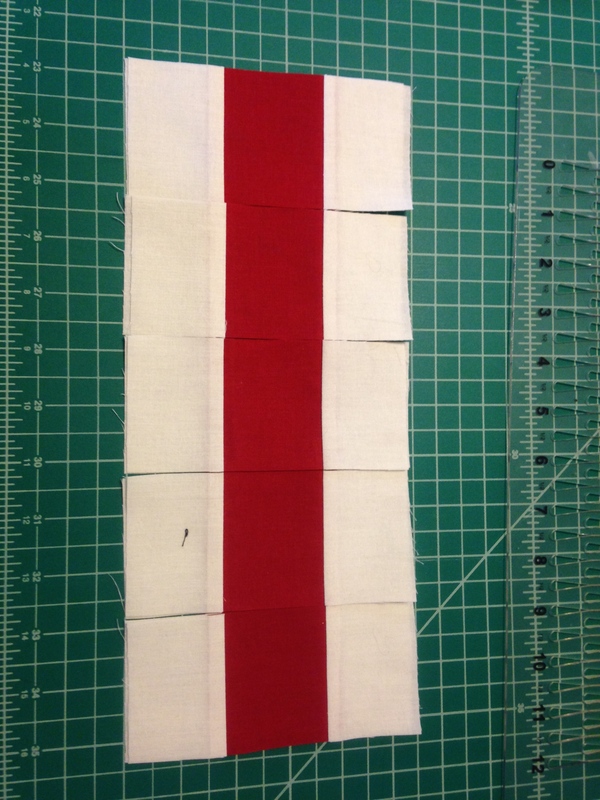 And if the quilt was over 24″ long, I could always add a center loop to make sure it didn’t sag. 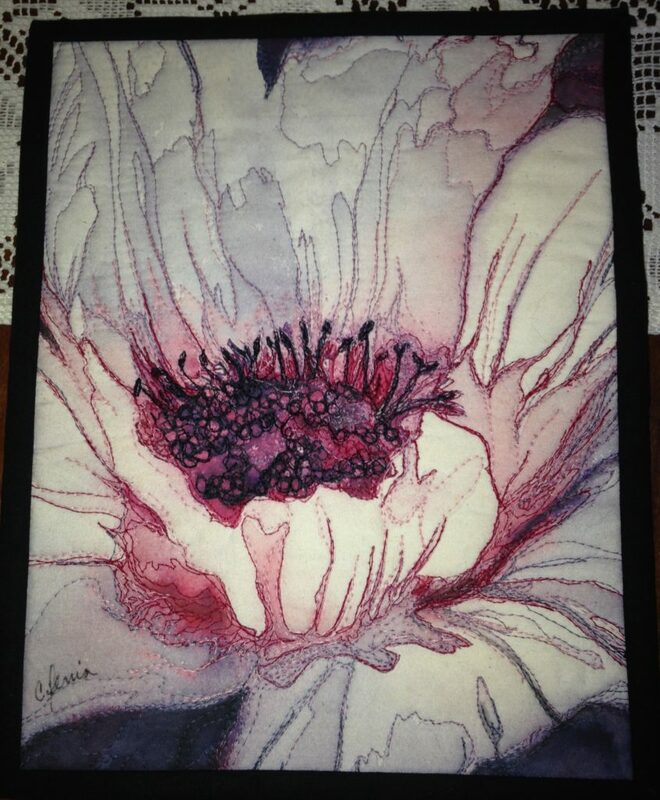 Perfect answer for any wall hanging quilt not longer than the 36″ length of the yardstick. If over 36″ I have an idea too. 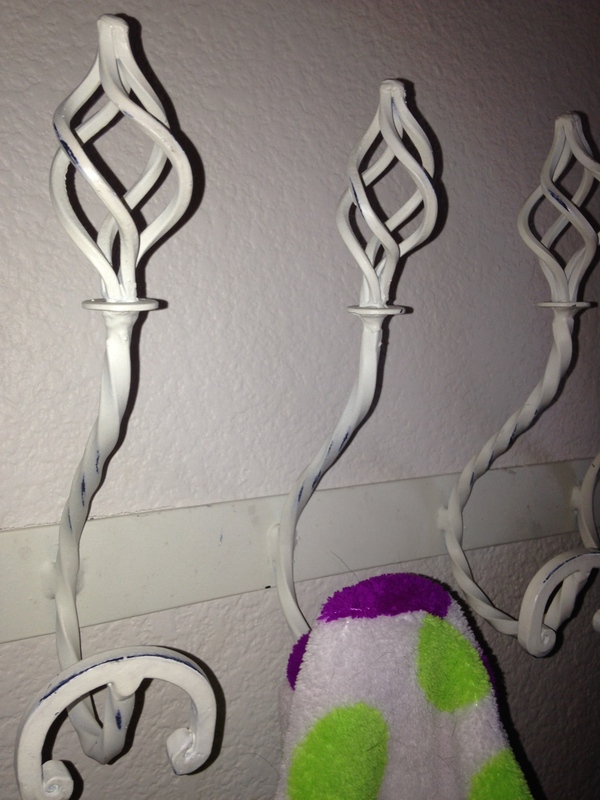 Use a piece of cheap wall molding that is flat. They even sell it pre-finished white! 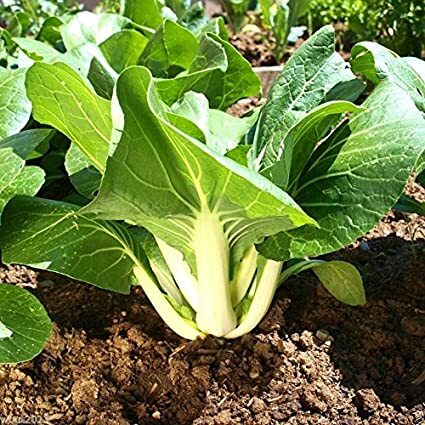 Also flat and comes in very long lengths if needed. I have some of that laying around too from home improvement projects. 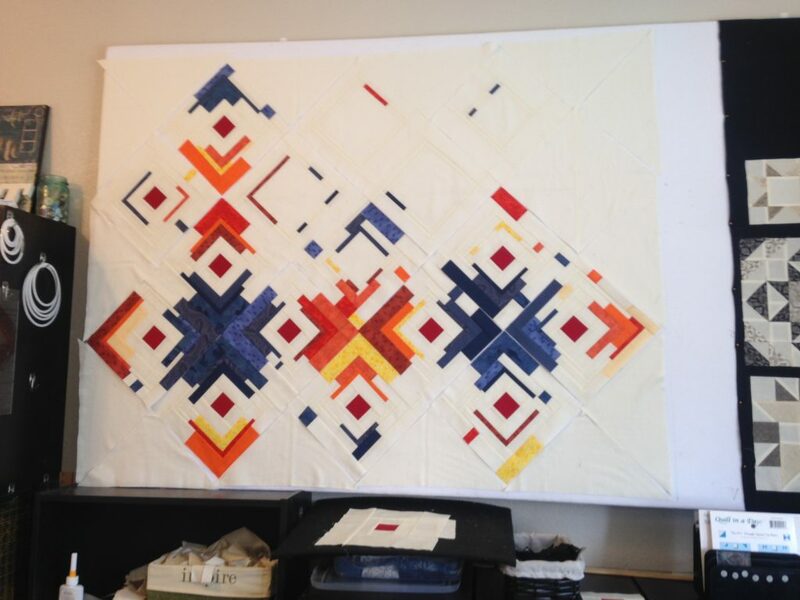 Showing a larger art quilt one with a center loop. 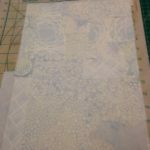 My Process: Cut two squares of fabric to match the backing of the quilt at 4″ square and fold in half on the diagonal wrong sides together and press. 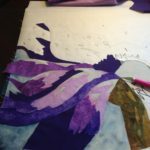 If I need a loop in the center for a little larger art quilt, I use a 5″ Sq that I hemmed on two sides, then fold and press in half. 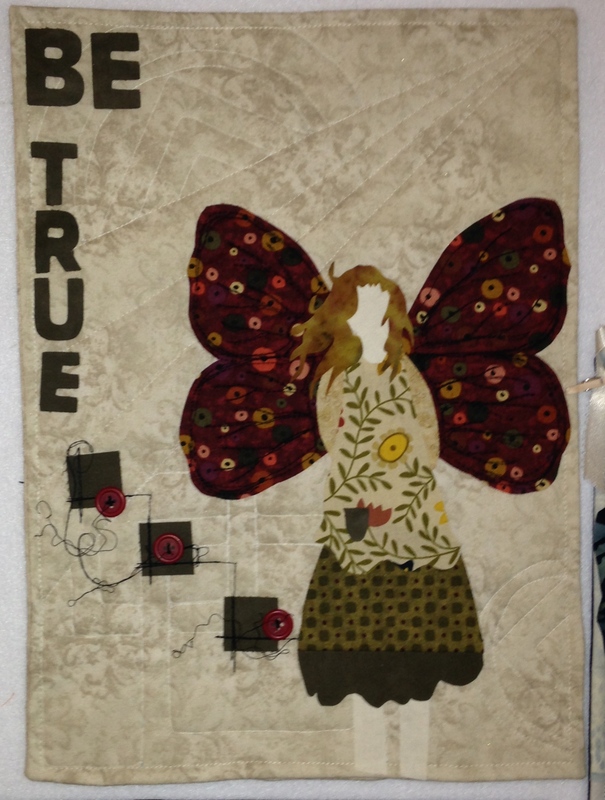 Place the squares on opposite corners on the backside at the top of the quilt with raw edges in the corners. 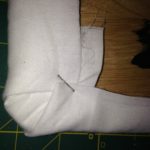 Pin or use basting glue to hold in place. Place a center loop in center if used. Sew on the binding as usual to the front side of the quilt and this will sew the squares in the corners at the same time. 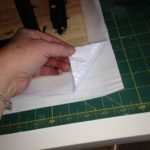 Flip the binding to the back and hand sew using a blind stitch as usual to finish off.Cut a wooden yardstick about 1/4″-1/2″ shorter than the quilt width INSIDE the binding. 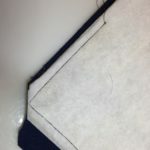 In other words, don’t measure the binding width, only from where it is sewn on at the squares. 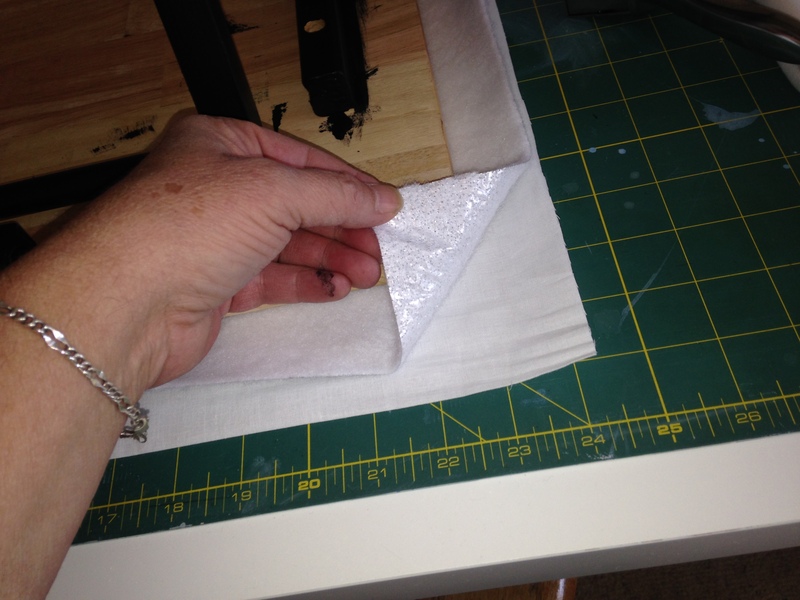 I use my handy miter box to make a clean and straight cut but you don’t have to use one if you don’t have one. 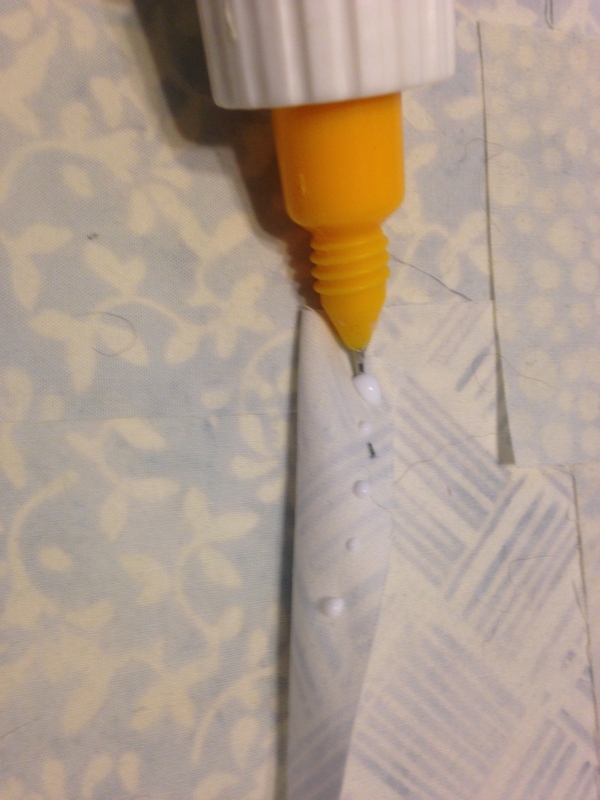 Hit the cut ends with a little sandpaper to make sure no splinters are there. Insert into the squares and hang! 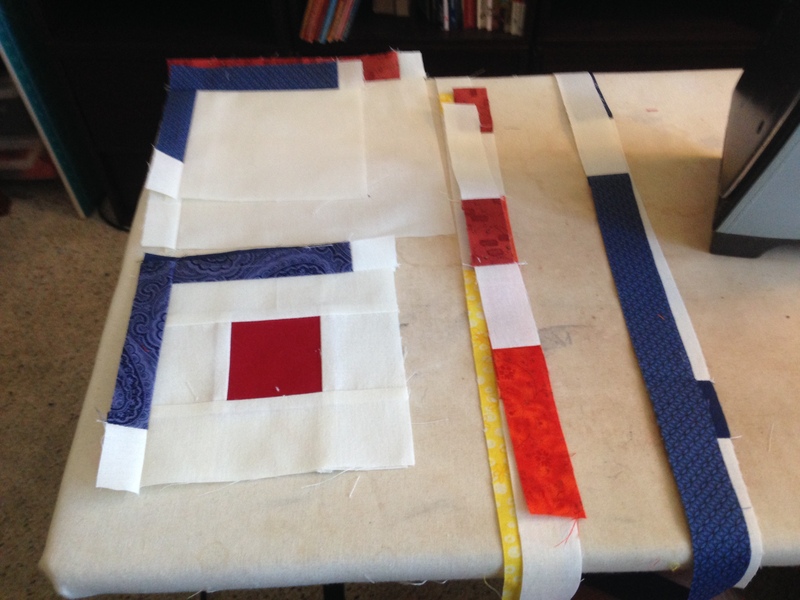 To hang on the wall, I use a level and pencil to mark two small horizontal lines about 2-4″ smaller than the yardstick I cut, depending on the overall size of the quilt, and at about 1-1/2″ lower than I want the top to be at. Then I hammer in two small finish nails on those lines. 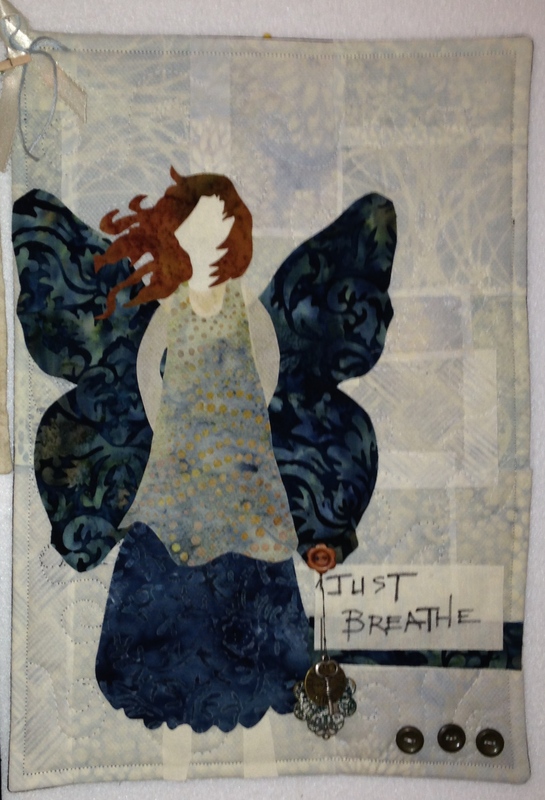 Hang my art quilt. Always level and I can slide it a little side to side if I’m trying to line up with some other items. 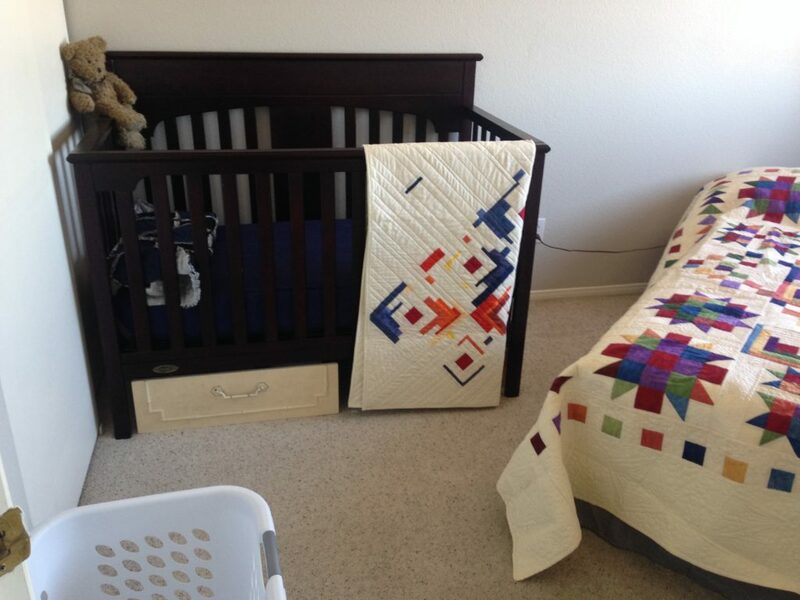 I’ve been making a LOT of quilts lately with babies on the way and some long over due one for the other grand-kids. And in doing so, I’ve been using a LOT of my various rulers. Issue is, I really don’t have a good storing system for most of them. 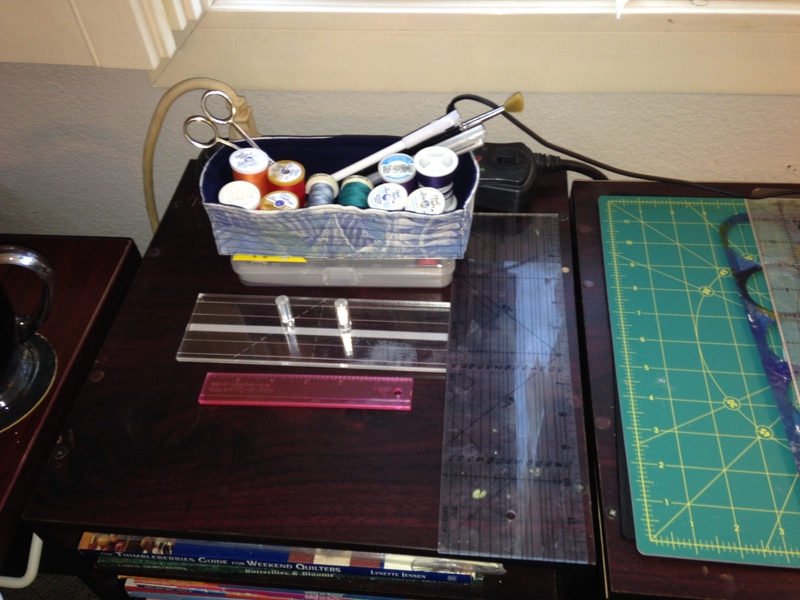 I have Quilting Rulers, Template Rulers, Cutting Rulers… and on and on. 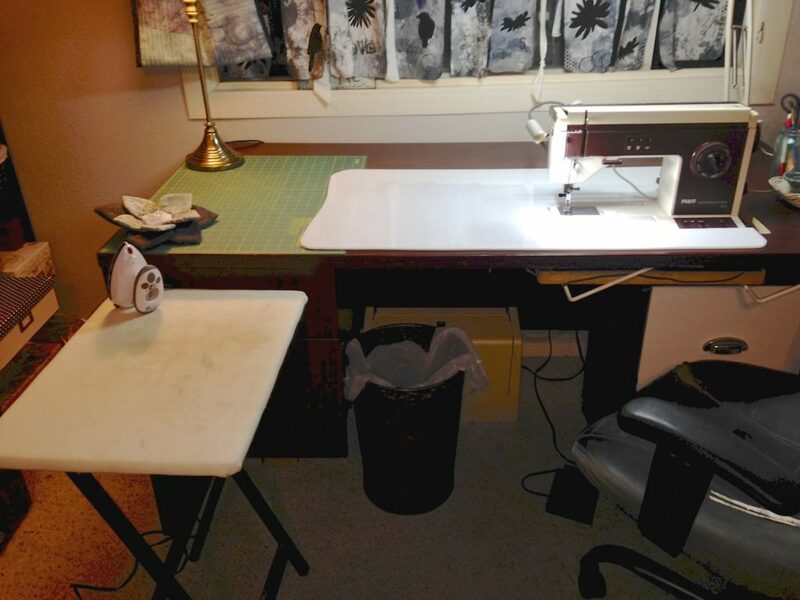 I by no means have as many as most quilters, but I do use what I have consistently. Such a pain to figure out where to store them so they are handy when I want to use them. Currently I have the majority of smaller ones in a plastic letter holder on my shelf above the ironing table and that works for most of them, but not the larger ones and the smaller ones get lost in there. 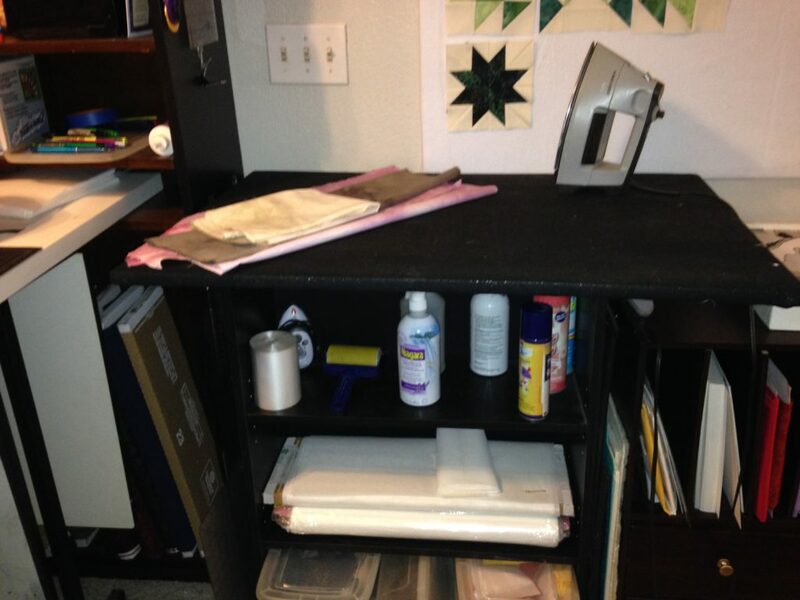 I store my larger ones on little command hooks to the side of my cutting table. Those are my most frequent used and that works for me very well. 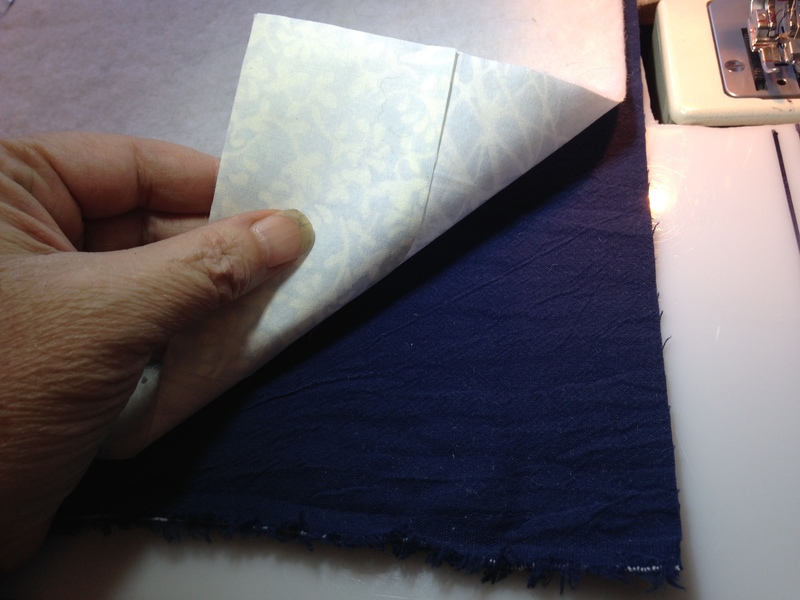 But that doesn’t work for my 16 1/2″ Square one which I use for squaring off quilt blocks. Need something to hold them all except for the long cutting ones I use daily. I searched for something on the internet and found several for sale at various places. 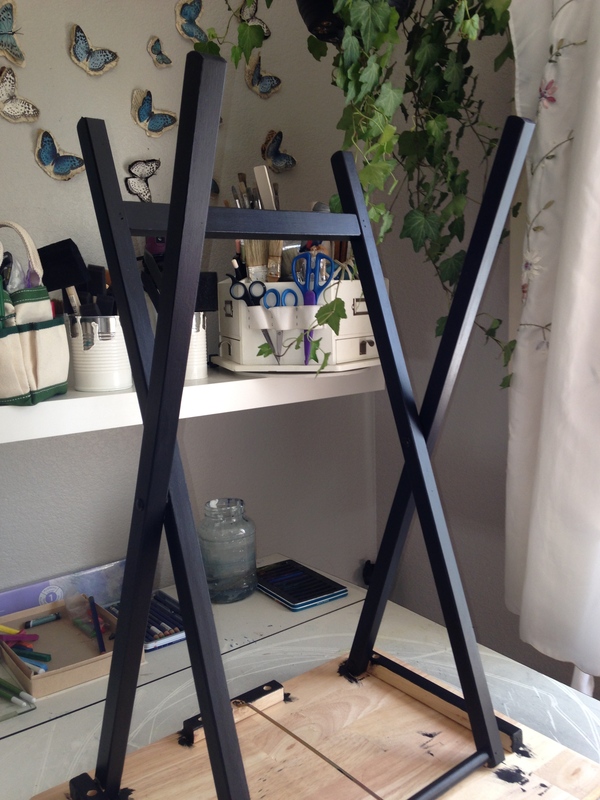 Huh… well, for about $2 of wood, and maybe an hour of time, I can make couple! So I went to designing a couple that would fit my personal work space. 🙂 Now, nothing against the person who makes these and sells, but come on! $42?! And the ones that store on the wall won’t do as my walls are filled with no room to spare. 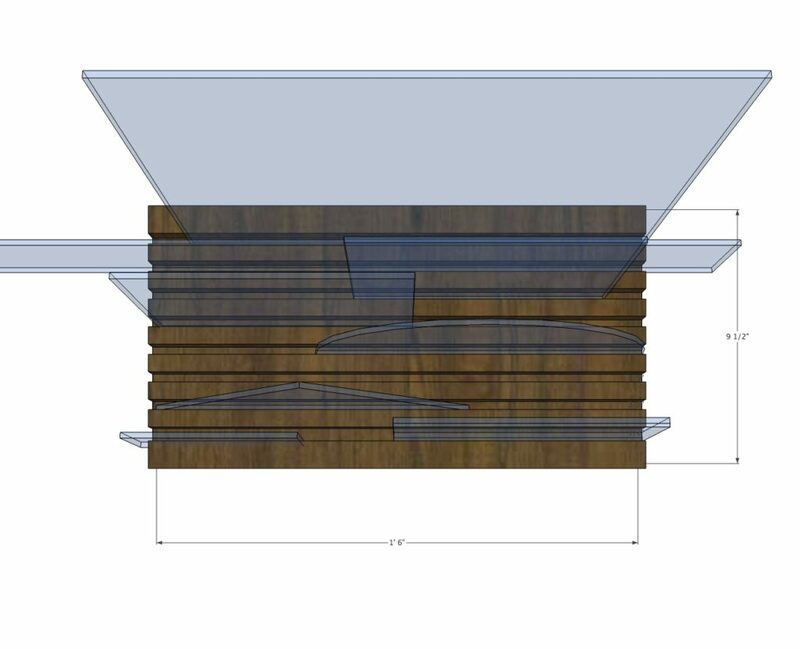 So here is my design. 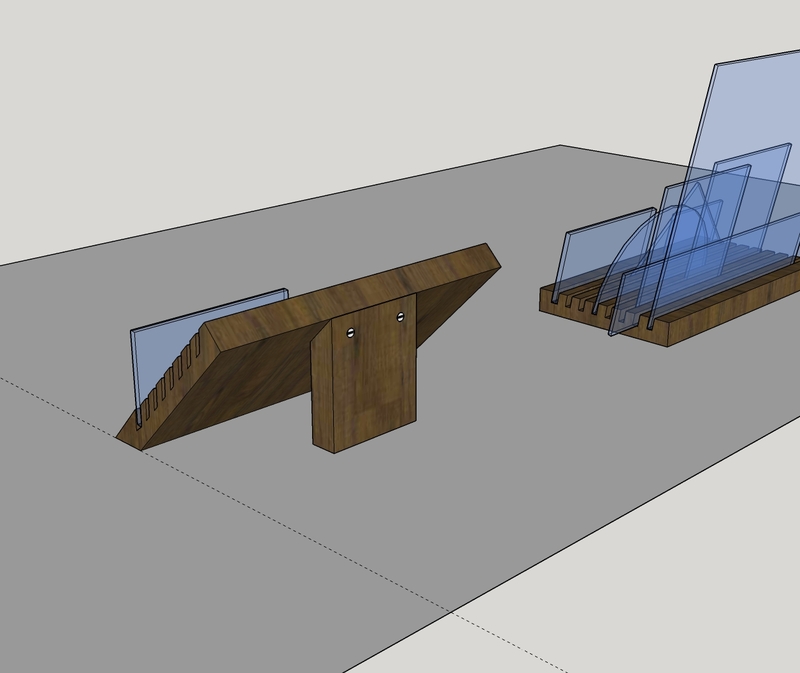 I did this up in 3D in my CAD program so I can show the Mr on sizes I want. 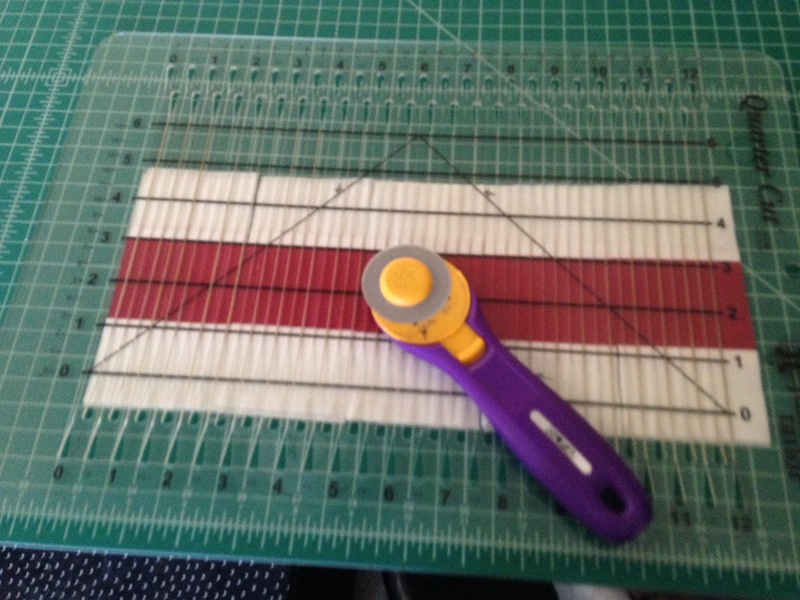 My quilting foot rulers are thicker, about 3/8″+. 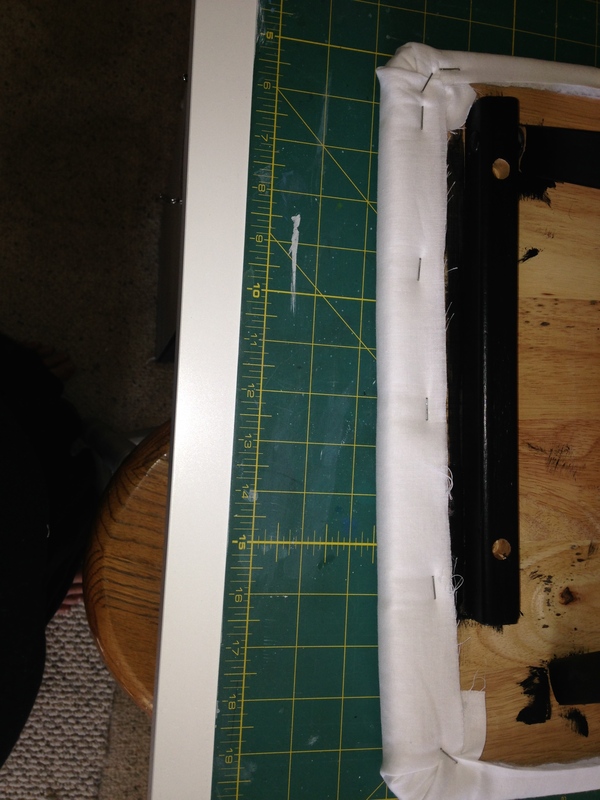 My template rulers and cutting rulers are about 1/8″-1/4″ thick. 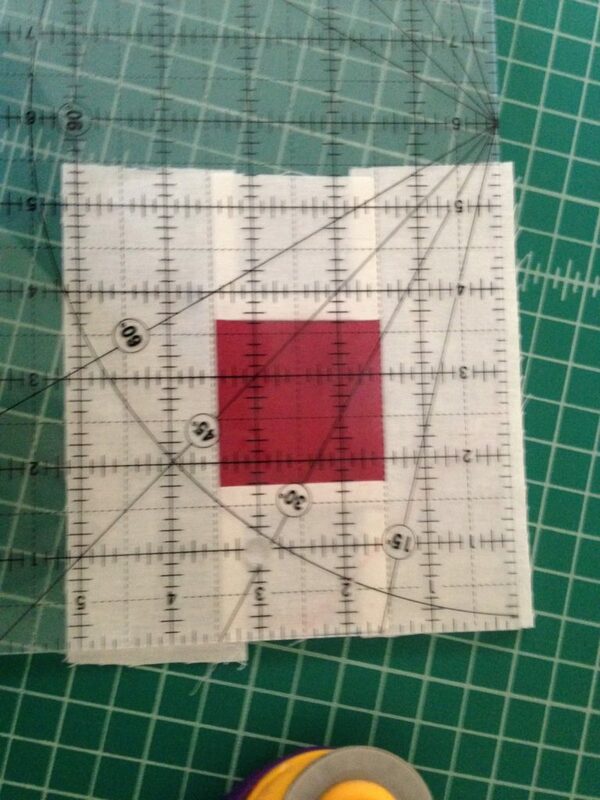 I only need maybe one slot or two for the quilting foot rulers, so the rest of the slots can be narrower so I can fit more slots. I figure a 2×10 piece of wood would work well, (we have several in the garage just waiting for a purpose… this does NOT help my anti-hoarding speech I give the Mr monthly. LOL ). Has enough weight to hold my largest rulers and enough depth. 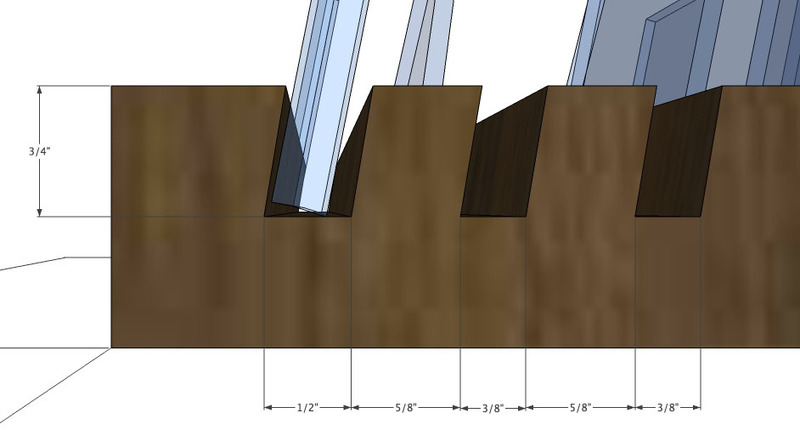 That’s the nominal size so in reality it’s 9 1/2″ x 1 1/2″. Cutting it to be 18″ long should work well. Then I can store it on the shelf above the table all within easy reach. 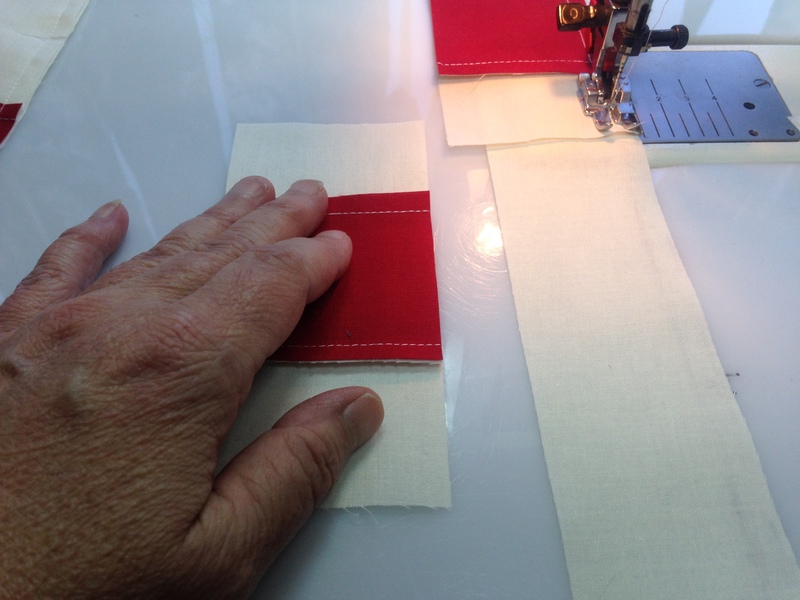 First slot should be 1/2″ wide and rest can be 3/8″ wide with 1/2″ to 5/8″ between slots. 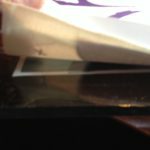 Or 1″ from front to front of the slots. This gives me plenty of room between to store my instruction sheets with the rulers between the slots for the specialty rulers I have too. 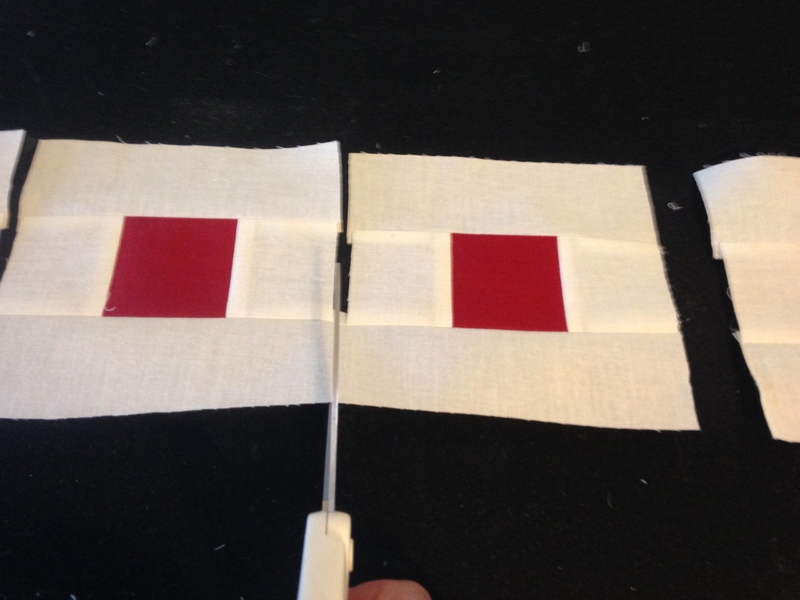 Make it 3/4″ deep and give them a slight angle towards the back to hold the rulers in place to lean towards the rear. Pretty simple yes? I think so. I can stain it and seal it up with a spray polyurethane to make it nice looking and easy to clean. And if better half wants to get real ambitious. 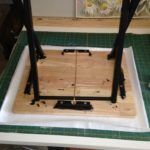 We can make it into a stand easily by cutting a 45 degree angle on the front and the slots angled same and adding a piece of wood to the back to hold it up like an easel. 🙂 But I’d be happy with either one honestly. 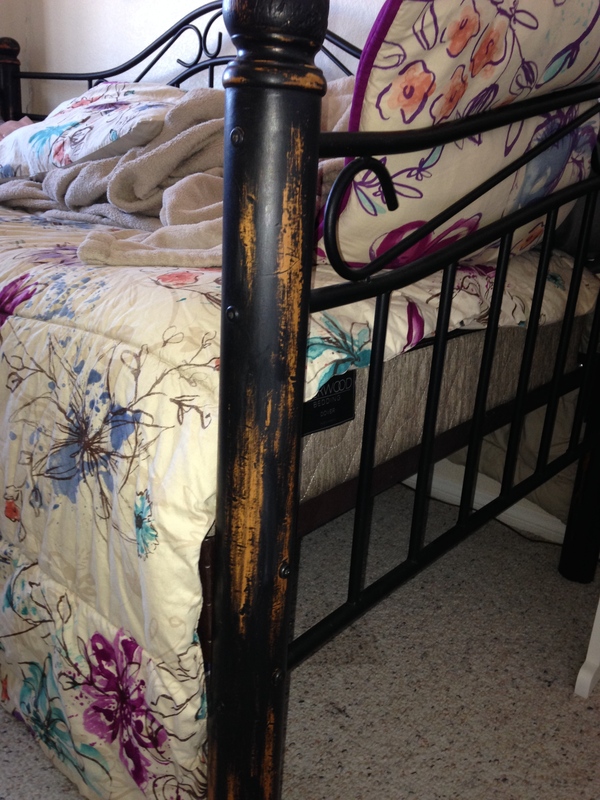 And I still need to finish quilting my own bed quilt… been hanging over the stair railing for a few months now. 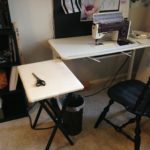 Got frustrated with my sewing machine and table trying to do such a large quilt and needed a break… one day… one day maybe I can get a long arm quilting machine. Sigh… still dreaming. But with the price being about the same as car… I have to keep my priorities in check. 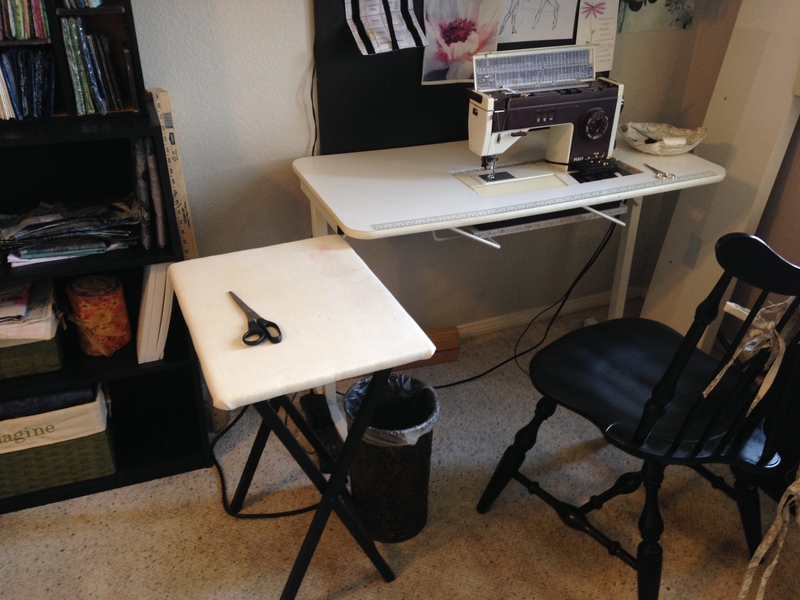 Besides… need that bigger Studio first. 😉 All in the plans for our new homestead. As promised, I’m posting my first 4 weeks of my self imposed weekly challenge. 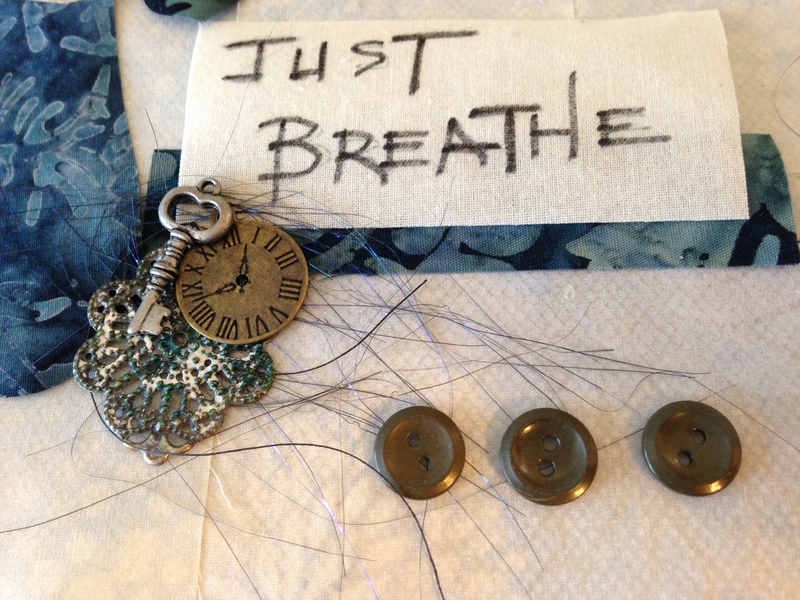 I can say at this point this little exercise has made my creativity BOOM! Here I am 7 weeks later and I have so many ideas I had to start making lists of future projects so I could get them out of my head and focus at my tasks at hand. 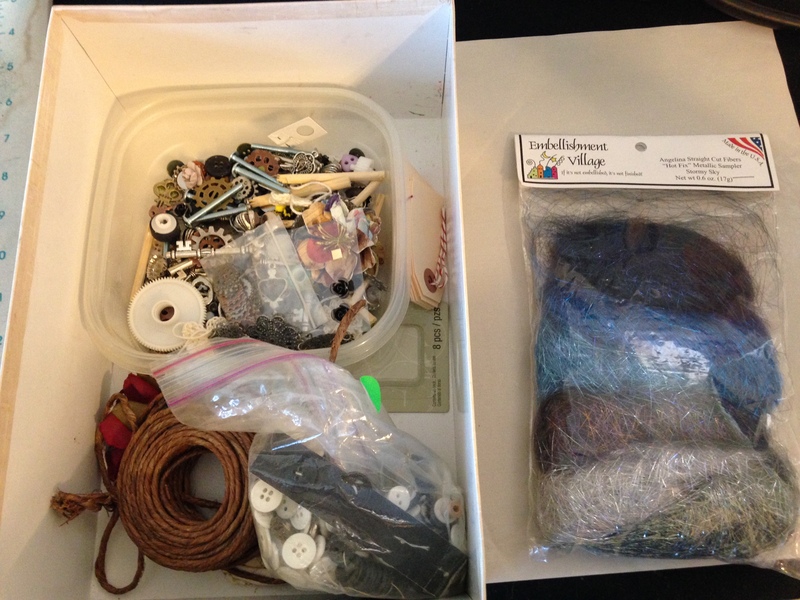 I’ve also made a decision to open the dreaded UFO (Unfinished Objects) Boxes. For those who don’t quilt, this may be a new term to you. 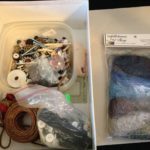 But for us obsessive compulsive quilters, we have MANY of these items. 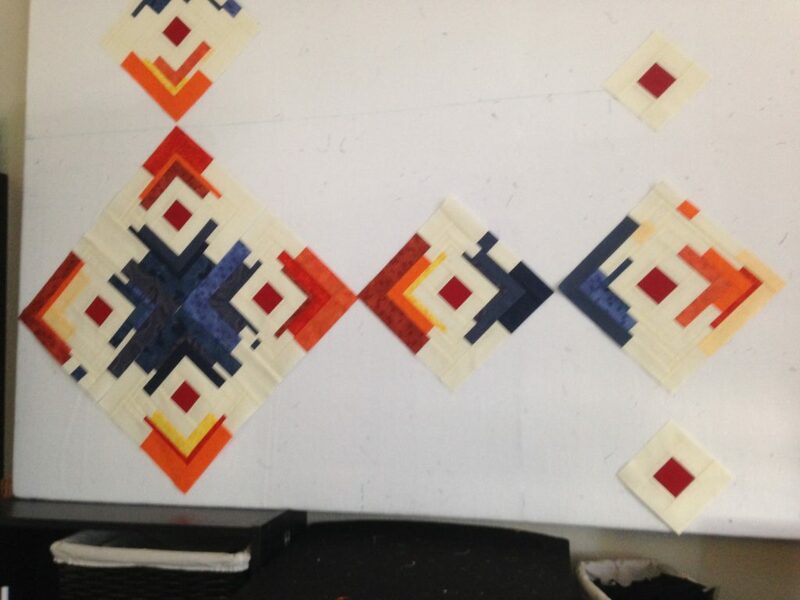 Patterns we’ve tried and didn’t like or got stuck on. New techniques we wanted to try and learn and have basically a sample of an item. Even items that life got in the way of or a lack of a certain supply we needed to finish and it got put on the back burner. End result, I have pulled them out, ok, I’ve pulled out SOME of them, and have made another self imposed challenge to finish them up or incorporate into something useful. 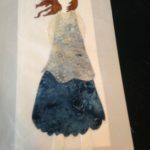 If I really find something that I don’t even want to deal with, I will offer it to my fellow quilters in my Quilt Guild. Back to week 1. This was how it all started. I had seen the AWESOME portrait art quilter, Tammie Bowser, on Quilting Arts TV Episode 1607-2 while I was catching up on my 1600 series of shows, and was fascinated with her technique. I wanted to create one of these of my little Miss Bailey, but knew I had to learn and master the technique before taking on a portrait. 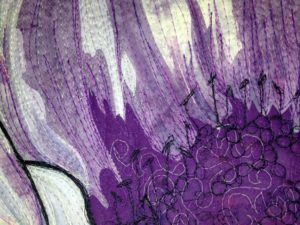 Now they do have a free Gerber Daisy Pattern, which had disappeared being uploaded, and when they did finally get it up, I had to finish some quilts with deadlines in process so it became one of my UFOs… see where this is going? LOL Eight months later I got back to this one. It’s another reason why I’m doing the self imposed challenge. I never did do the Gerber Daisy from Tammie. I chose to use one of my own flowers. 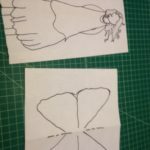 I was also really overwhelmed looking at pixel boxes of her pattern and decided I needed to modify the technique of how to make the pattern that made sense to me and was a little easier on my eyes. 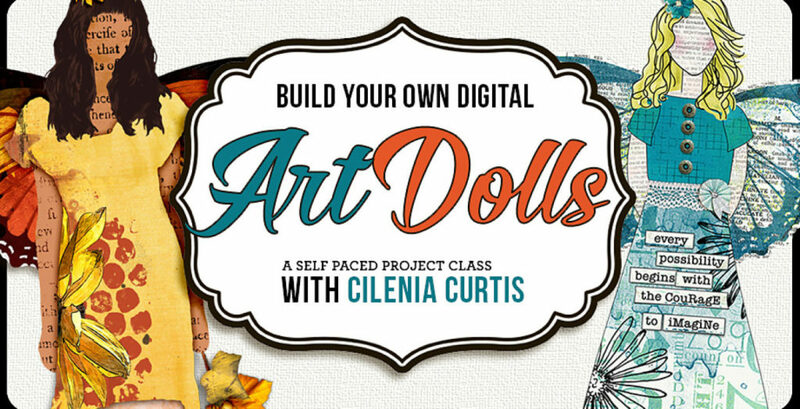 She used a free program to turn the photo into ‘boxes’ of value pixels. I don’t have the program and it’s no longer available anyways. So being a Digital Artist, I felt I could wing this on my own. Choosing the flower was easy, a coneflower. One of my favorite flowers in the garden. For this first one, I simply had the photo blown up and printed at my local Staples store. They ‘accidentally’ printed on a thicker poster paper instead of the thinner Engineering paper I had requested. They thought they were doing me a favor. LOL A lot more difficult to see through as I was tracing my pattern. Now they understand why I’m printing these photos and their purpose. I also had it printed in color this first one. Next time, need to do a black and white only. Easier to see also. Then I could just deal with values and not worry about color. 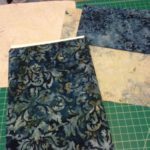 I found when I printed this in color, I became obsessed in trying to match up the colors and even dyed a few swatches of fabrics to fit in. NOT what I wanted this exercise to be. Lesson 1: Use my Photoshop to convert to a black and white photo for my pattern. Will be less inhibitive to my creative flow. Lesson 2: More of a hind sight, but next one I will use Photoshop filters to set my values and maybe even the cut lines for the pattern added. Lesson 3: Decide the number of values and colors in the beginning. Saves some aggravation later. Onto the technique I wanted to learn. 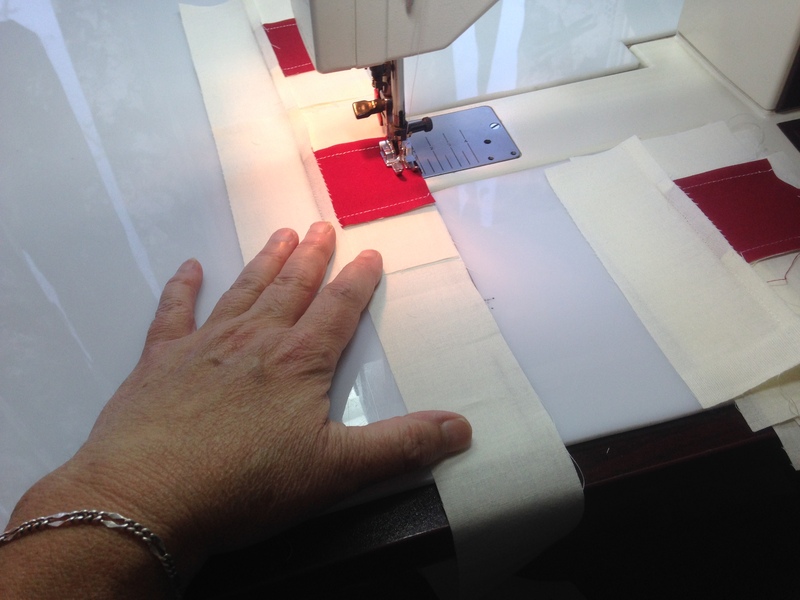 Tammie uses a different kind of fusible web than I had always used. Hmmm a little more money, but might be worth it. She uses Steam a Seam 2. 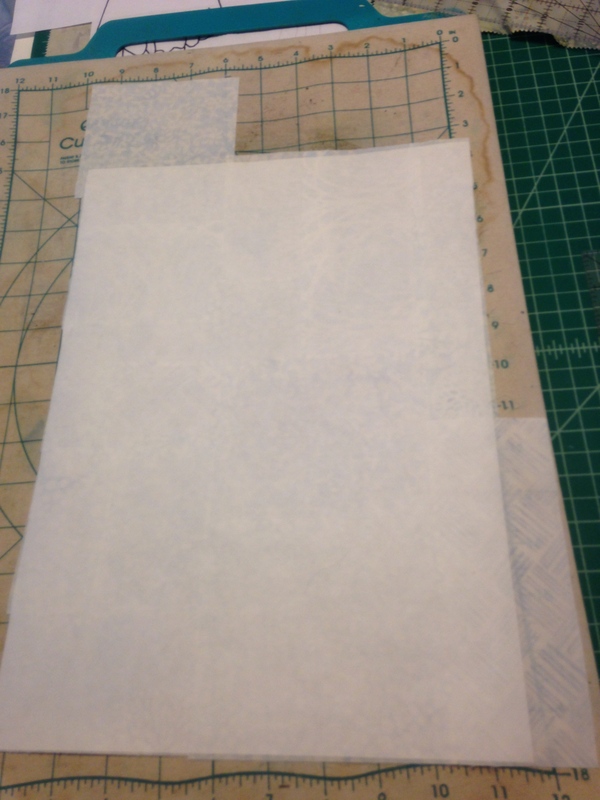 The advantage is that it is a little sticky after removing the paper unlike regular fusible web. I could see how handy this was while assembling. Ok, broke down and bought some at Amazon, even though I had a ROLL of Head N Bond Light sitting on my shelf. 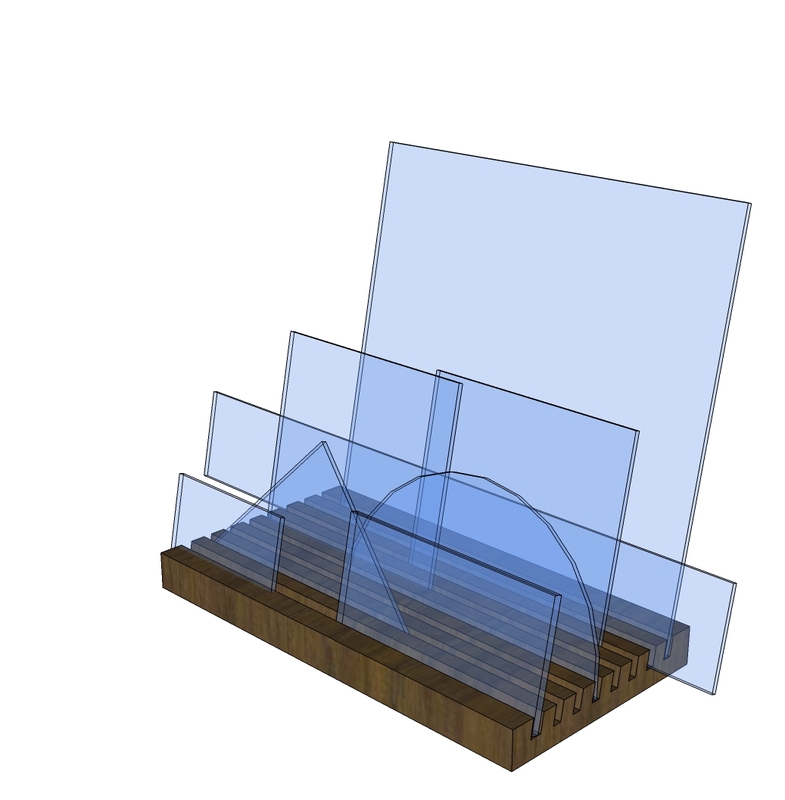 It comes in 9″x12″ sheets for the printer and needs to be cut down to print if you don’t have a wide format printer like I do. 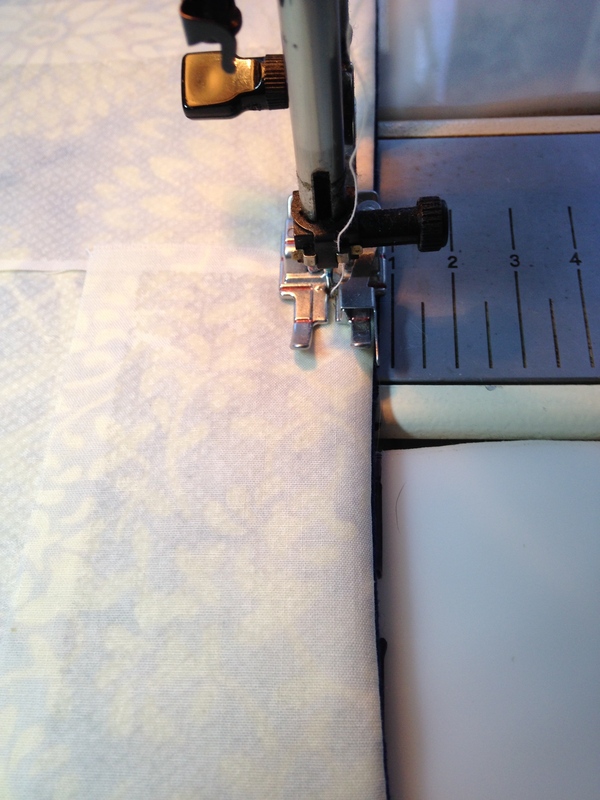 She prints out the image onto these sheets of Steam a Seam. I chose just to trace by hand. 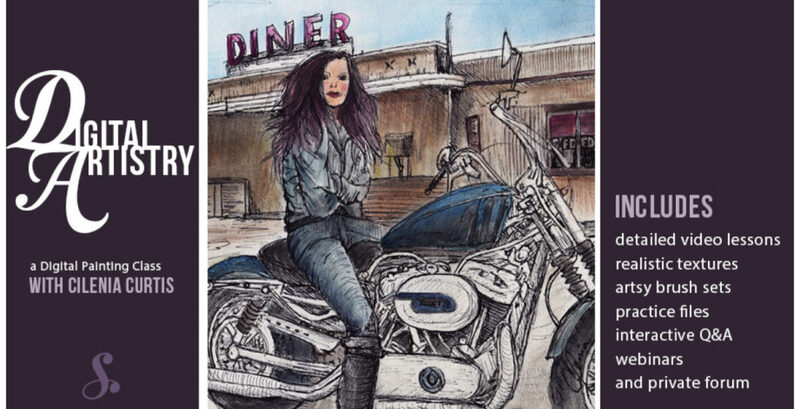 I numbered by values as I traced and put a big X in the background areas. 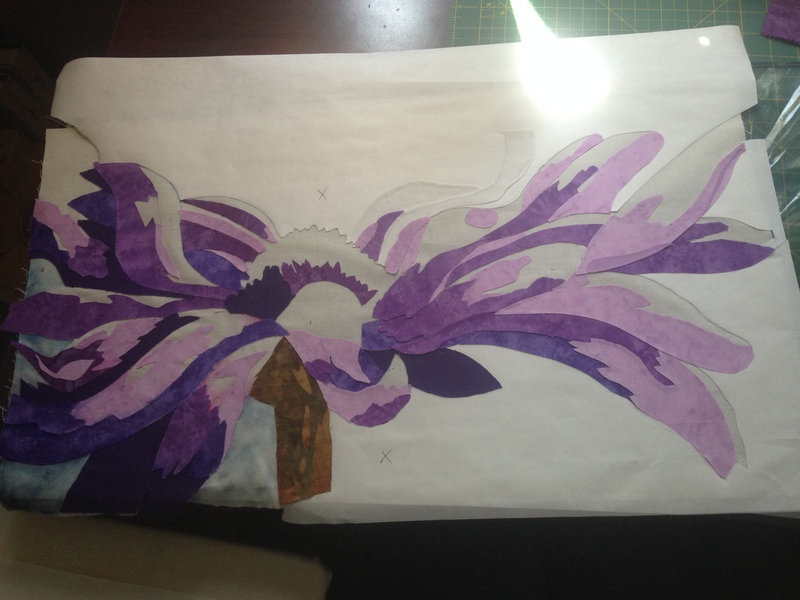 Wasn’t sure at this point how I wanted to handle the background other than I wanted a graduated color from dark to light as a sun ray might look. 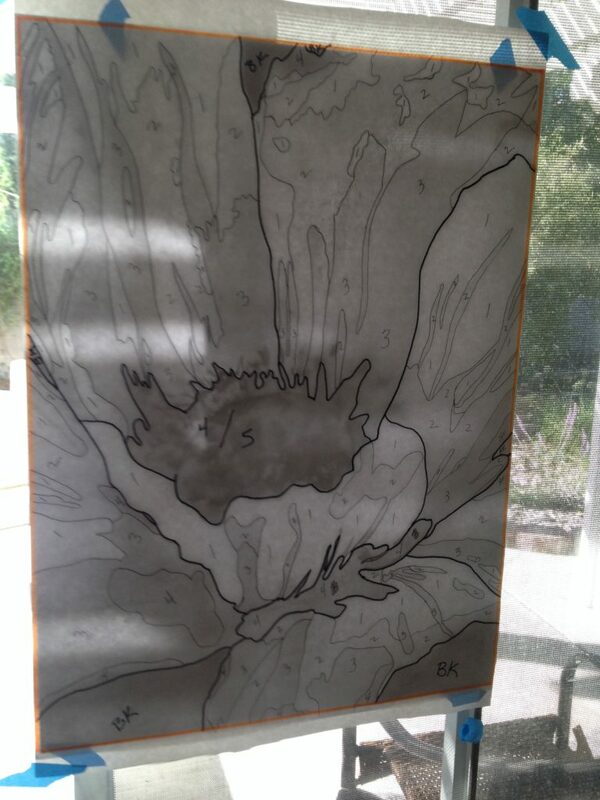 Lesson 4: Make sure to print or trace onto the paper side that is less sticky. If Tammie knew this, she neglected to mention it on the show. 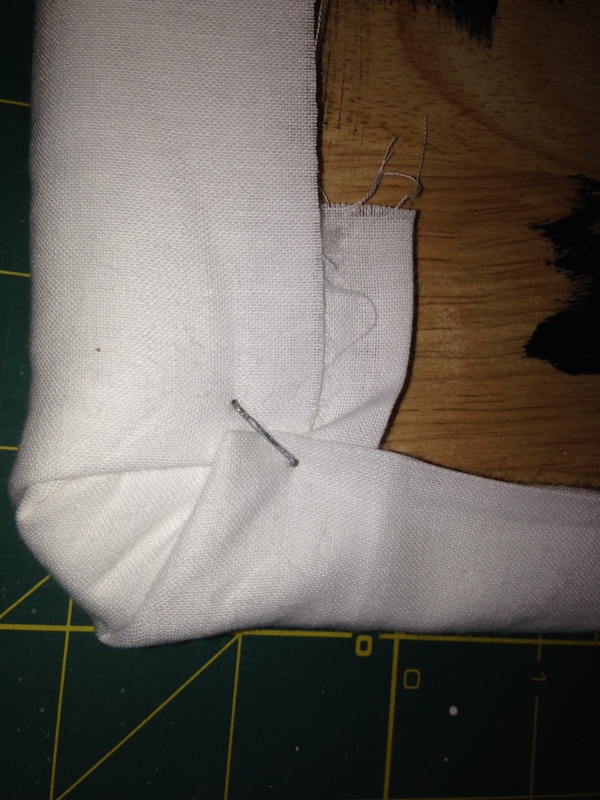 Learned since I made this that Steam a Seam has a lightly sticky and a heavier sticky side. 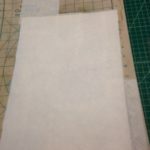 You want the lighter sticky on top where your pattern is so that while cutting out the template pieces it sticks more to the foundation fabric than the template pattern. 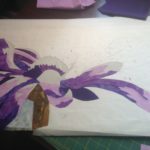 Next step was to use a cheap muslin fabric for a foundation background and peal the paper backing off one side of the fusible web and adhere it to the muslin. 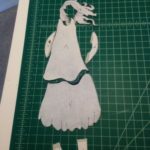 Next step for Tammie was to use an exacto knife and small scissors to cut away that top paper (being careful not to cut through the web and fabric below. Ok, THIS was NOT working for me. I had way to many times during this first one where I cut completely through and made a mess of it. Sure, practice made it better, but I did NOT like this at all. Had to be a better way…. for me at least. 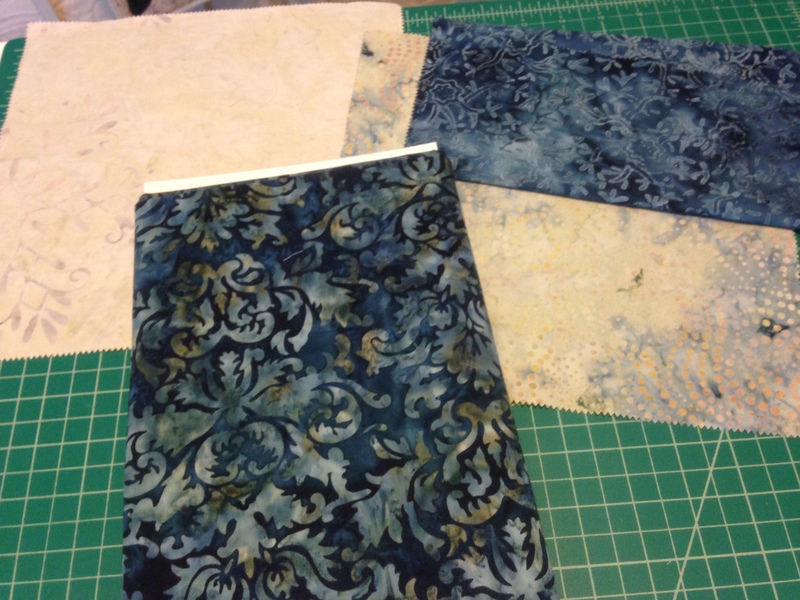 She then used the cut away paper top as her pattern to cut the fabric. 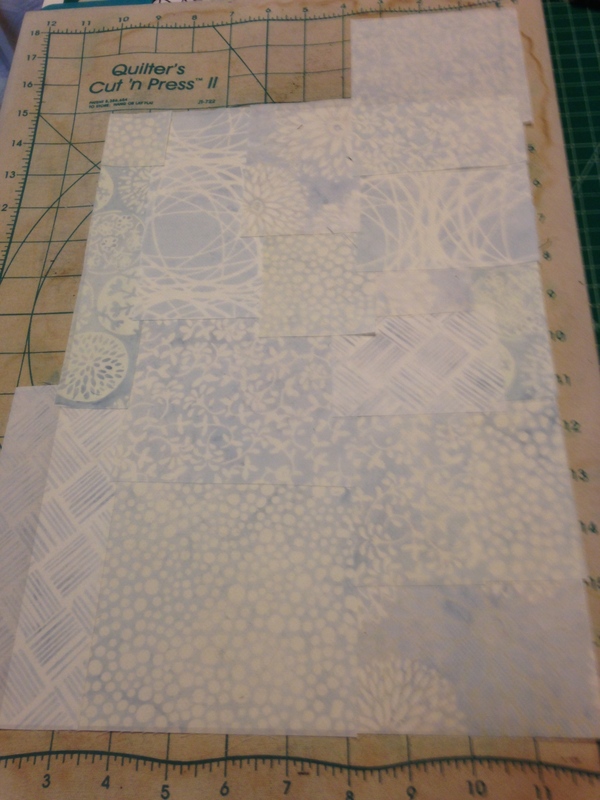 Adding a scant 1/8″ border around so that the pieces overlapped just slightly to avoid any background showing. 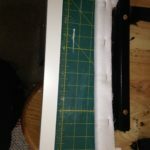 Hmmmm it doesn’t stick like a freezer paper template would while cutting. Slipping all over. Made for too much of an inaccurate cut for my liking. But, keep going. Don’t give up on this technique yet. 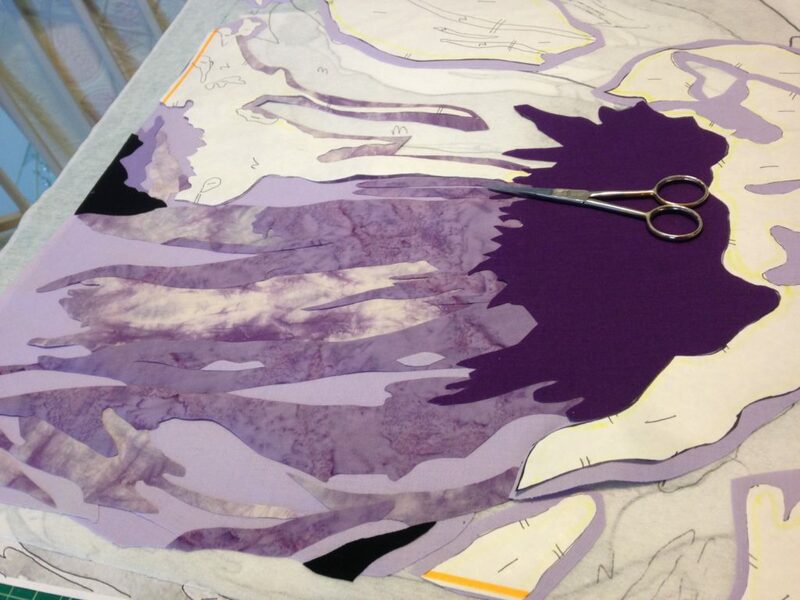 Then you simply take your cut fabrics and place them in the exact spot you cut the top paper template from. 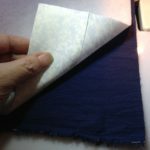 Because Steam A Seam is sticky, you can remove and adjust easily. 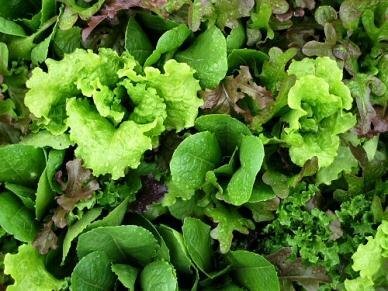 Nothing is permanent until you iron it down. I LOVED THIS! OK, sold on the product at this point, just not the process. 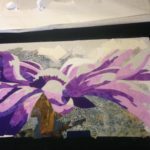 Some of the ‘In Process’ photos. Click to enlarge if you like. 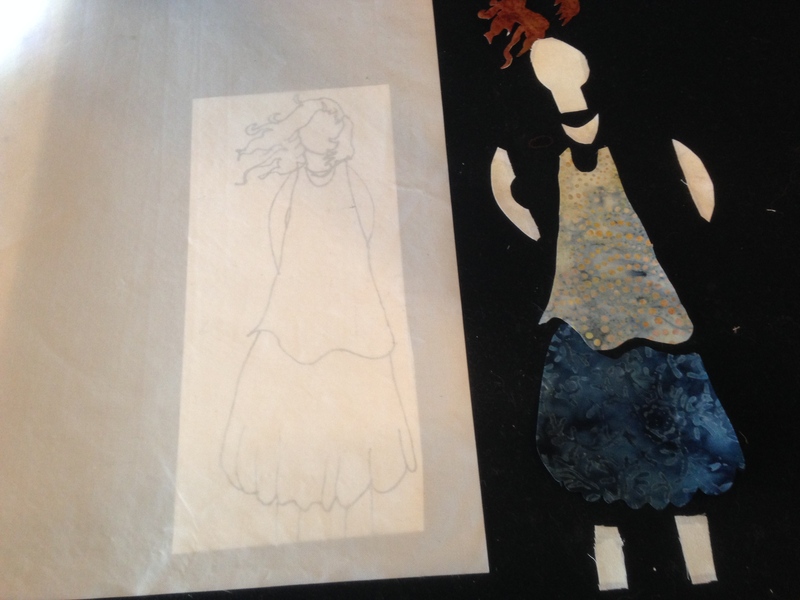 Process of cutting out template pieces from dark to light values and adhering to foundation. 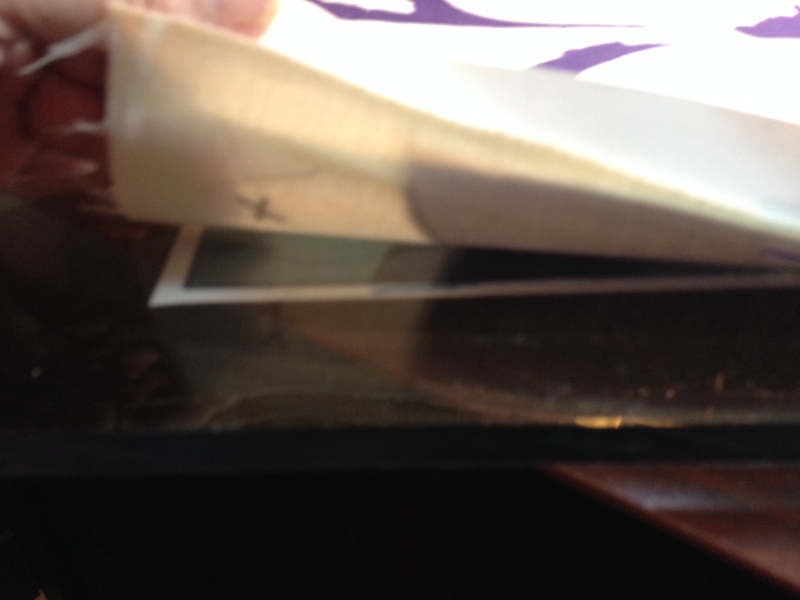 Shows how my printed photo was taped under a piece of plexiglass I had laying around. 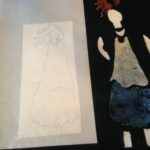 I ended up putting this on my lightbox to trace the pattern. Move pieces added. Decided it was better to work across image than to do the values in order. 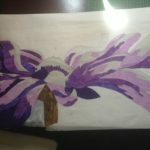 Painted a corner of the background during… decided I didn’t like it. 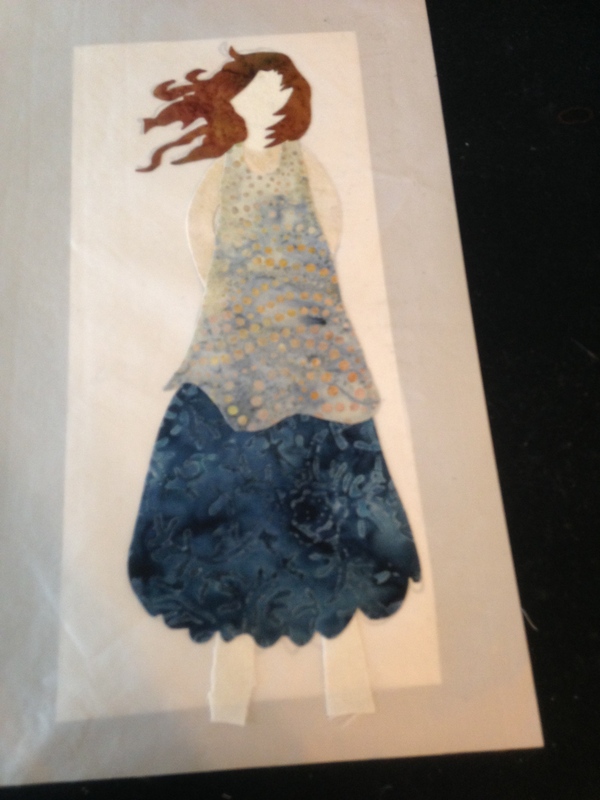 Decided to take cut up scraps of fabric and make a collage background. Came out ok, but won’t do again. Just not my style. 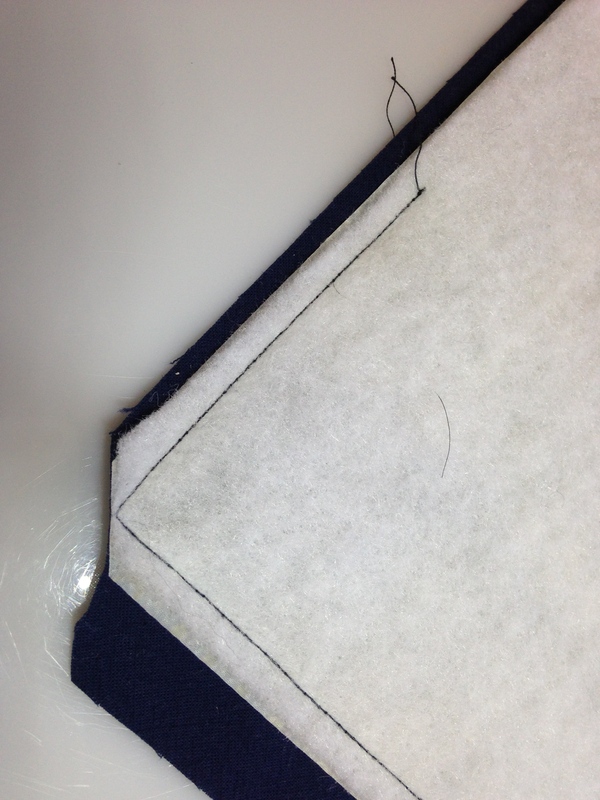 Lesson 5: This Steam a Seam 2 was too heavy or thick for any detailed thread sketching. 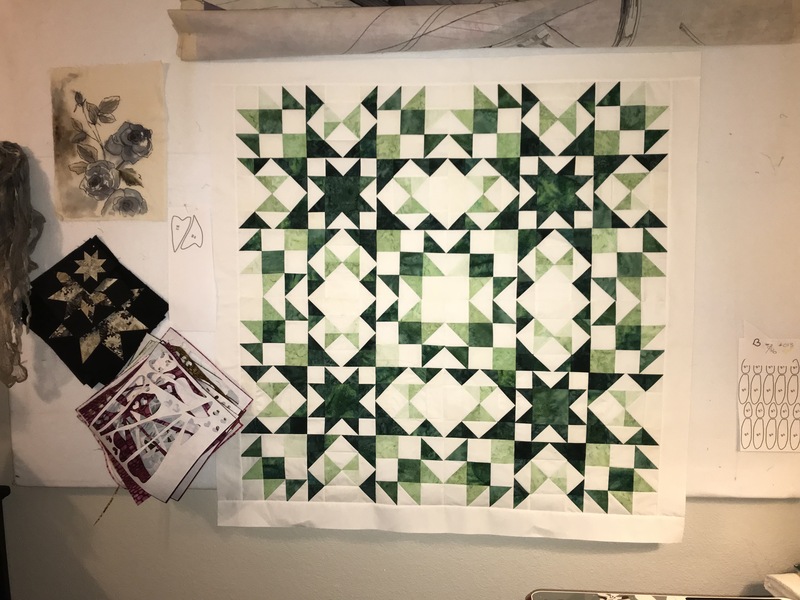 Made for a lot of frustrations during the quilting. Might have to stick to my feather weight or light weight Heat N Bond fusible web next one. 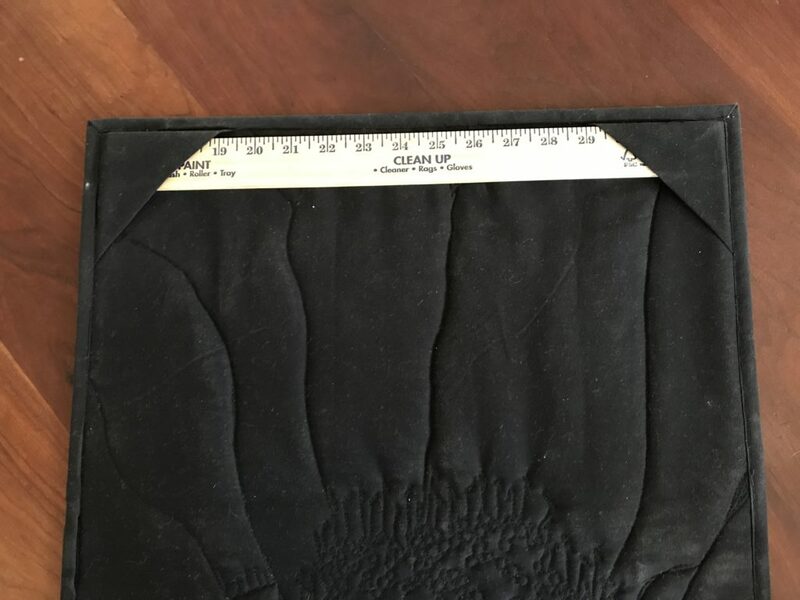 I understand this product is great if you don’t want to sew down all the edges, but it just was not the end result that wanted and had in my head. 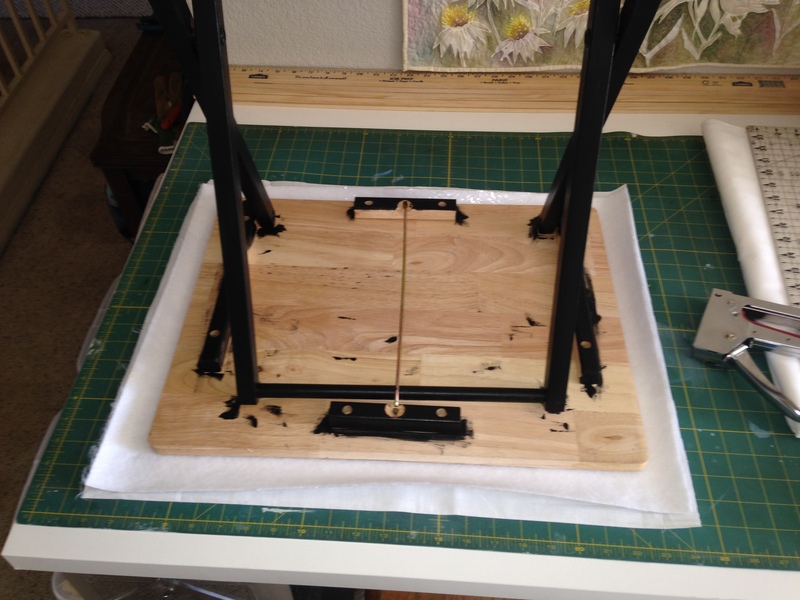 Added a black binding to finish and look like a framing of the art. I kind of lost the excitement of this art piece at this point. I didn’t like the process, I didn’t like the end result as much as I thought I would. 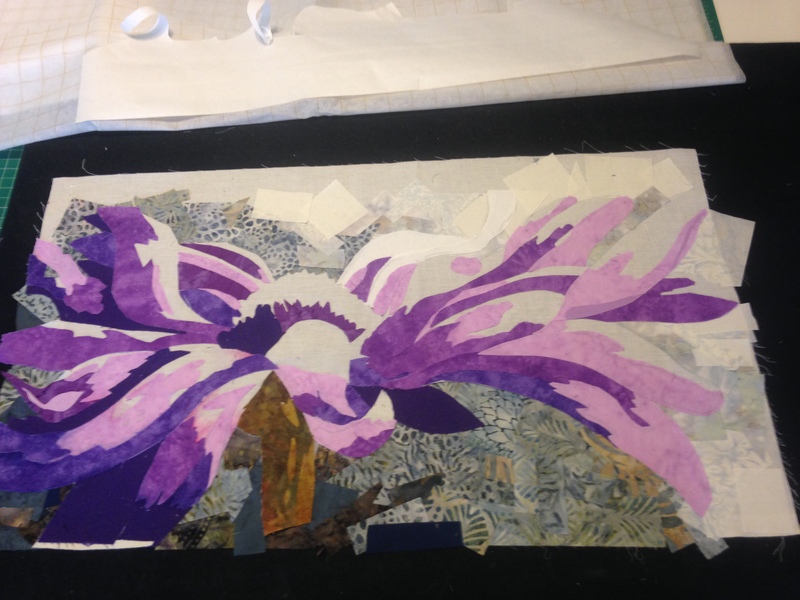 The number of values was too little for my liking, the collage background was so not my style and it looked more like an abstract art to me than I wanted. Everyone else liked it… just not me. I take notes while I’m learning a new technique. 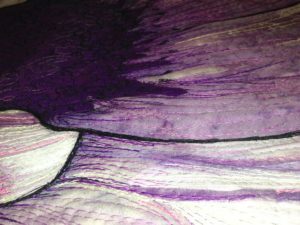 So it was off to the web in search of how some other quilt artist’s techniques worked and to pick some brains of fellow art quilters I know. Come back for the next few weeks challenges to see how I started combining processes, changing up some techniques and products to better get to where I wanted to go. I will just chalk this one up to bunch of lessons learned. 🙂 What works for others does not always work for me. I still LOVE Tammie’s work, but need to find a way to make it easier for myself and to make it my own also. I know… starting with Week 5? I will get the first 4 up and back date. Promise! YES! 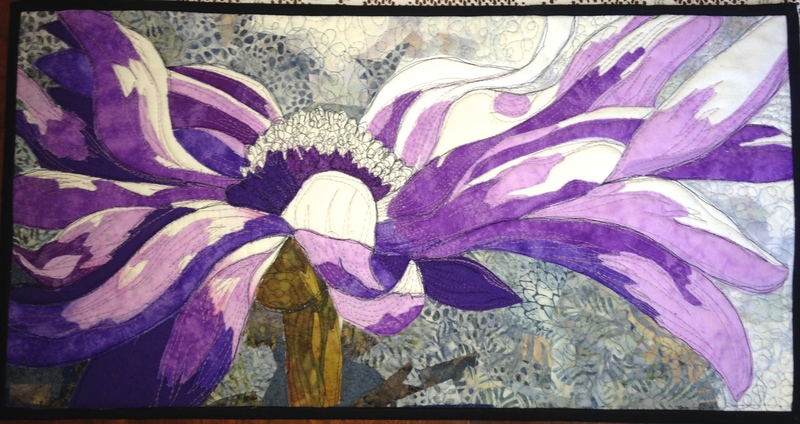 Finished up my 5th art quilt for my self inflicted challenge to complete an art quilt each week! Almost thought I wasn’t going to be able to finish this one on time as I ran out of the colored thread I wanted to use. But thank goodness for Amazon Prime and had new thread in 2 days. 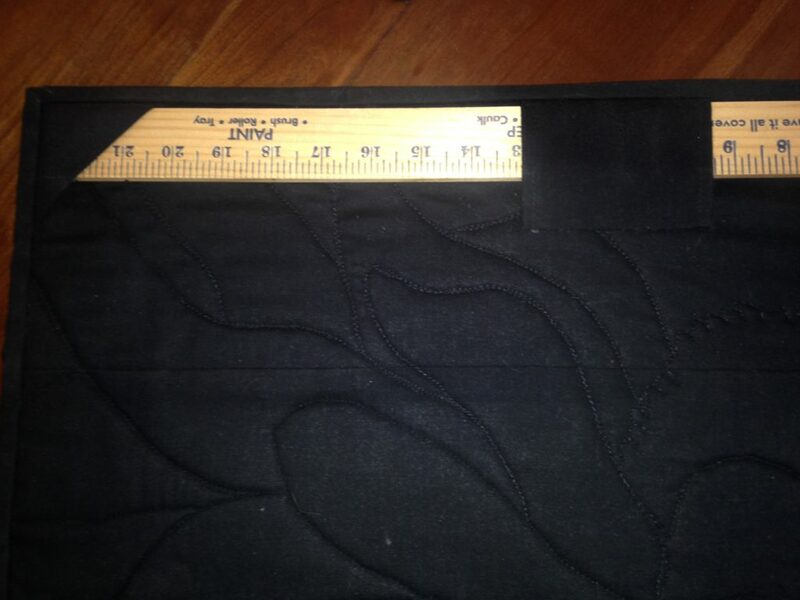 LOL It measures 18″x24″ and most of the fabrics, except for the solids, I had hand dyed previously. I also added just a little bit of some watercolor inks to give a few areas a little more depth. What I also did different on this one was add a little extra shredded up batting to certain areas so that it had even more depth. Very hard to see in the photos, but in real life, it turned out just like I had hoped. So here’s the original one I did last year. 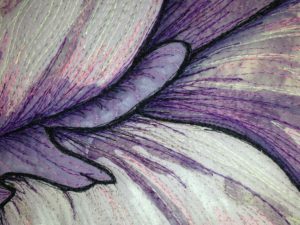 Painted on whole cloth piece of cotton fabric and then did thread sketching and quilting. I promise to take photos of my ENTIRE process next one! This has been an evolving process the past month and I have tried MANY techniques to get here. 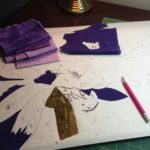 Creating my template pieces on freezer paper. 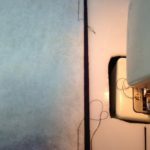 After I received my Engineering print, I used a black permanent marker to outline my values to create a template and numbered them Then I taped it to a window (my south facing sliding doors), and laid freezer paper over and traced and numbered again. 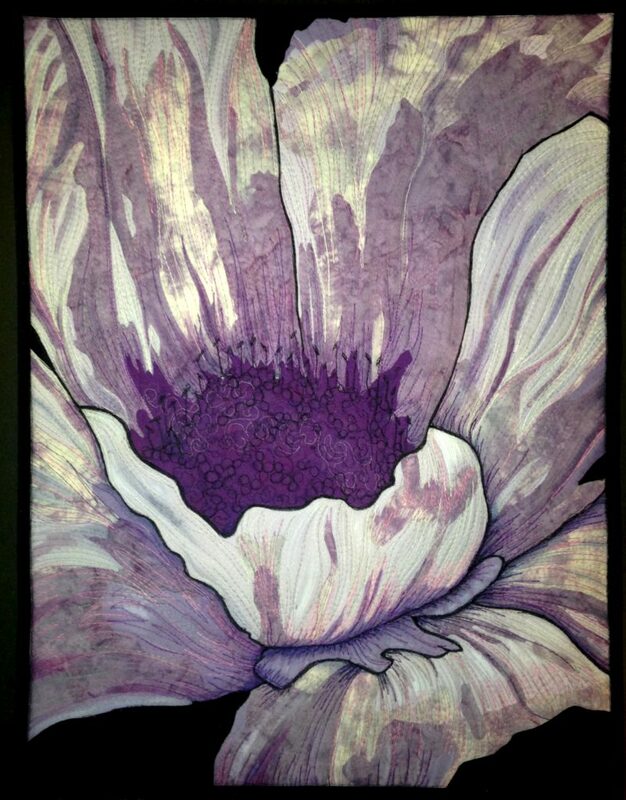 Smaller ones I can use my light box but it’s only 12″x18″. Doing this served two purposes. 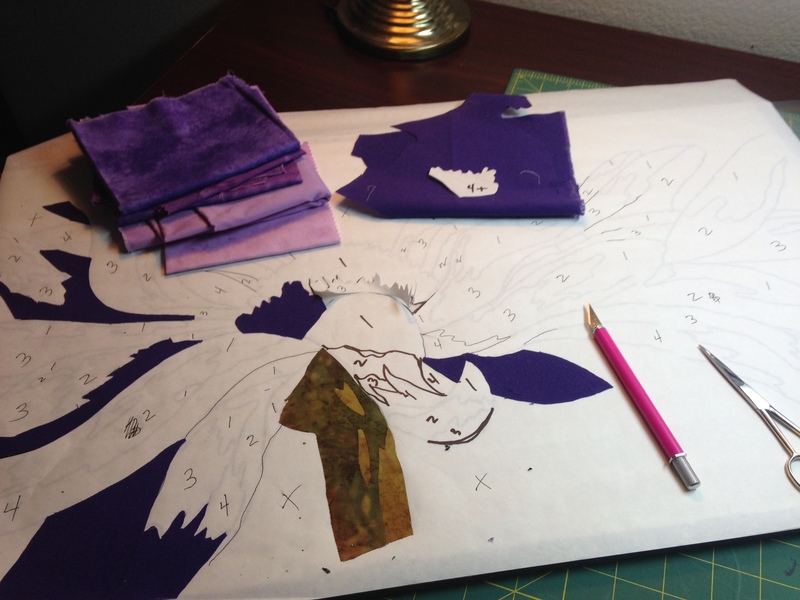 I will have my original print to refer to as I assemble the quilt, and doing it on freezer paper I would then cut up the pieces and be able to iron them temporarily to the front side of the fabric as my template pieces for cutting. 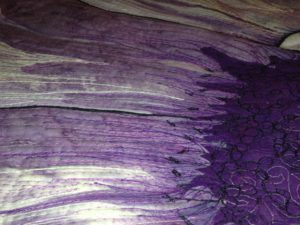 At the same time I traced it completely again onto a piece of Fusible Mid-Heavy Weight Stabilizer webbing. No numbers, just the basic outlines using a Frixion Pen that would iron away later. (Won’t do that again, will do on muslin like I did the last one. 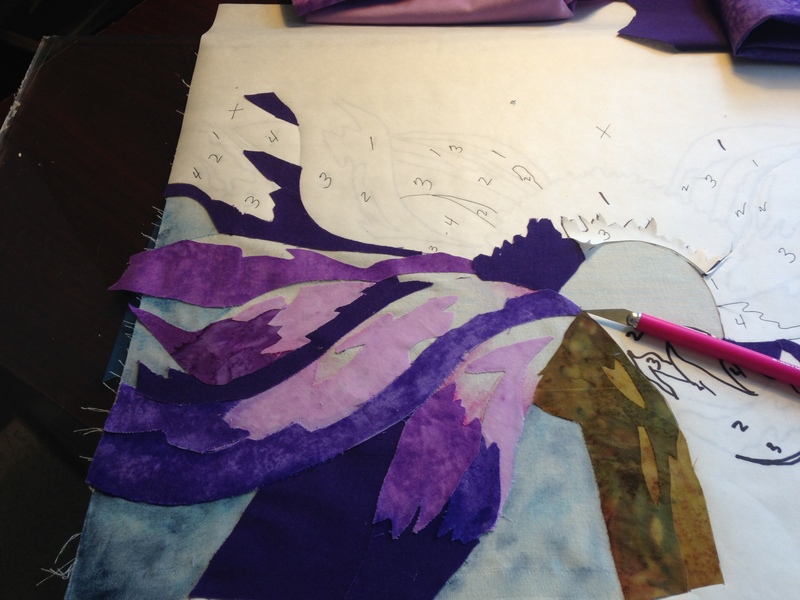 That fusing caused me a lot of issues while thread sketching and also the weight was just too stiff for my liking. 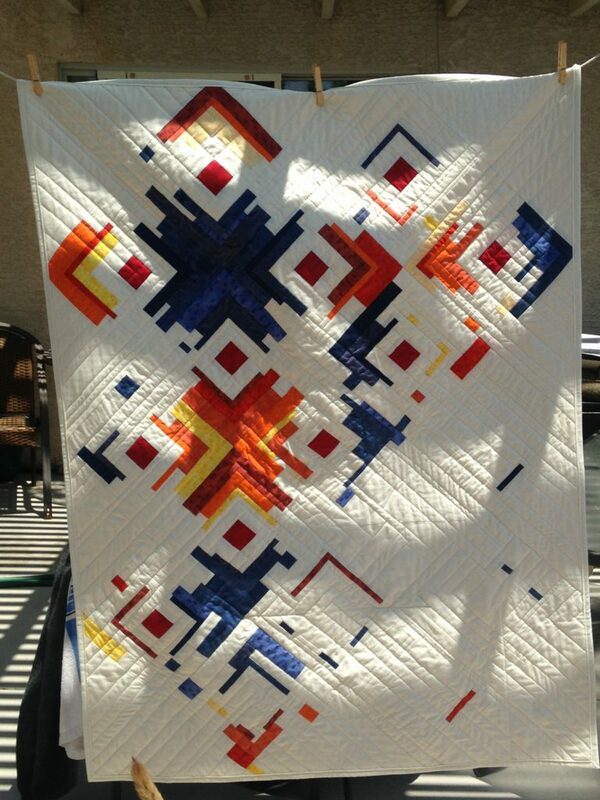 Does make for a very nice finished stiff art quilt though as I thought it would. LOL Maybe add after the thread sketching is completed. Will test out and let you know. Anyways…. 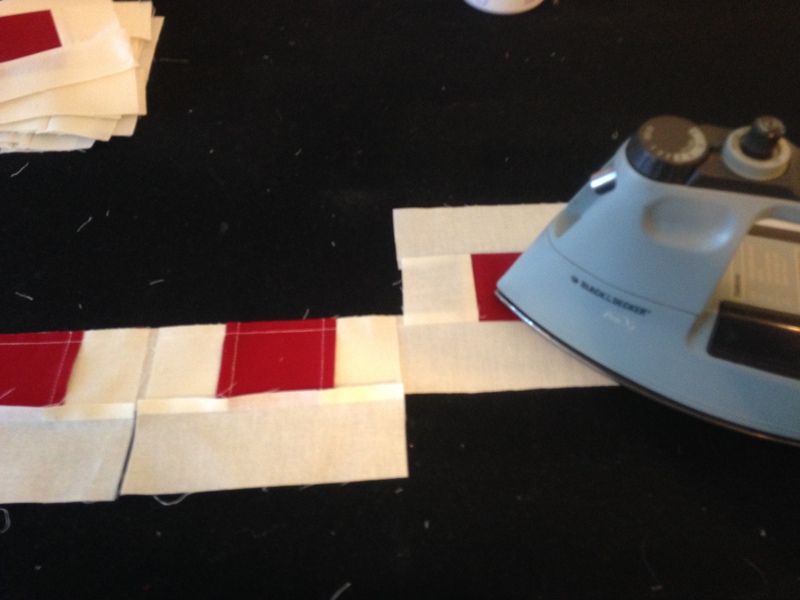 Then I take all those numbered pieces, iron to the front side of my fabric swatches, added my fusible web to the back of the fabric and spent the afternoon cutting them all up and kept each value organized in little trays. Then it was puzzle time! Actually, this is my favorite part next to the thread painting. lol Yes, I’m a puzzle freak! I don’t iron it down until every is there completely. 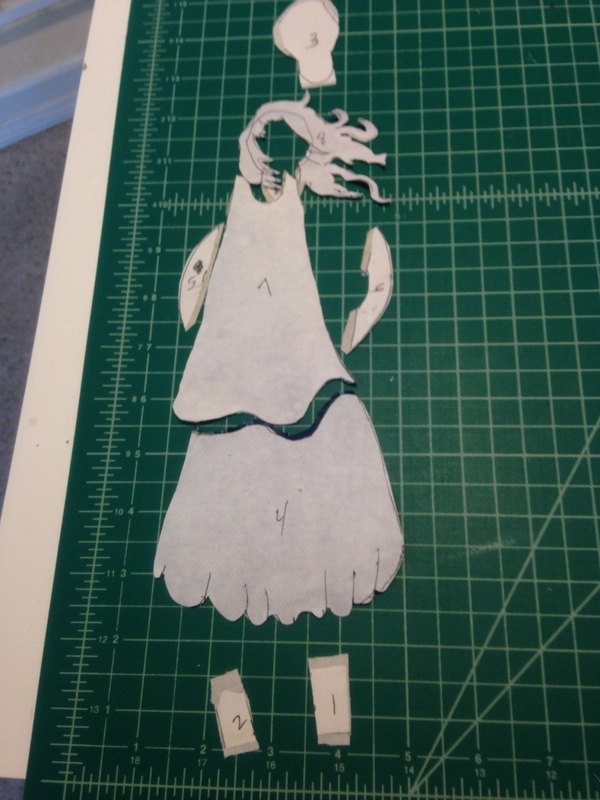 I use a very tiny smear of Tacky Glue in the center or ends of each piece to temporarily hold them or pins. Why? 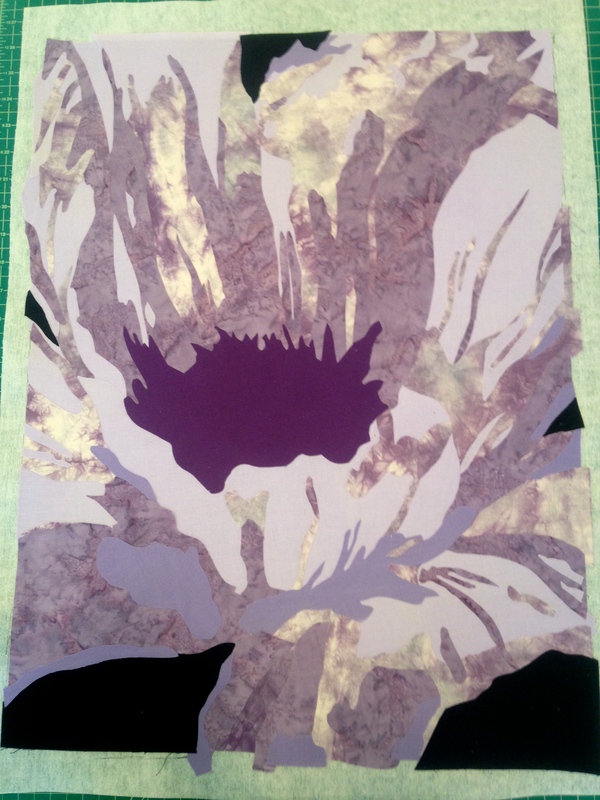 because I have put one together that I ironed and as I worked around the piece, I decided to change it up a bit. 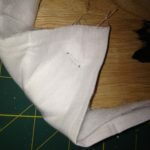 Can’t take it back off or move things slightly to fit better if it is already ironed down, but using just that tiny drop of glue I can lift it off and move easily. 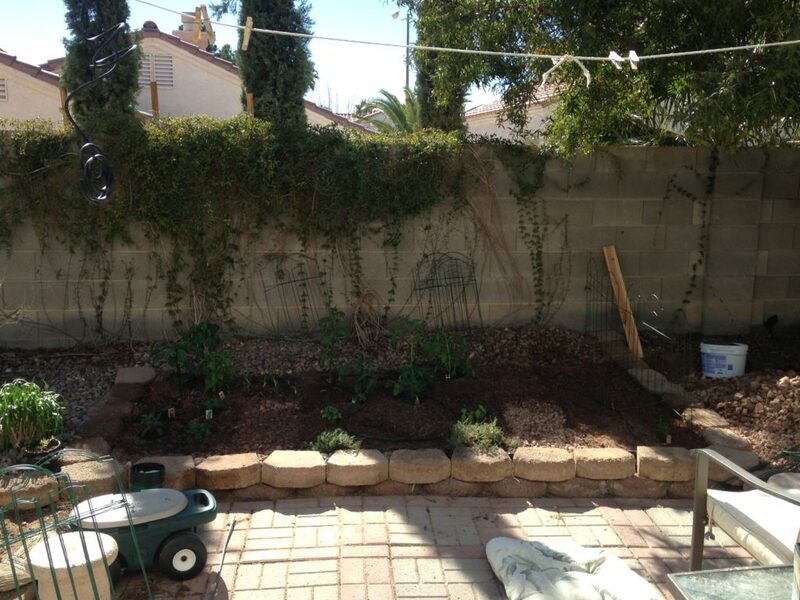 Here’s one photo are it partially going together. See the freezer paper on top. I LOVE when I get to take it off and reveal the colors below. It’s kinda like opening a Christmas present. 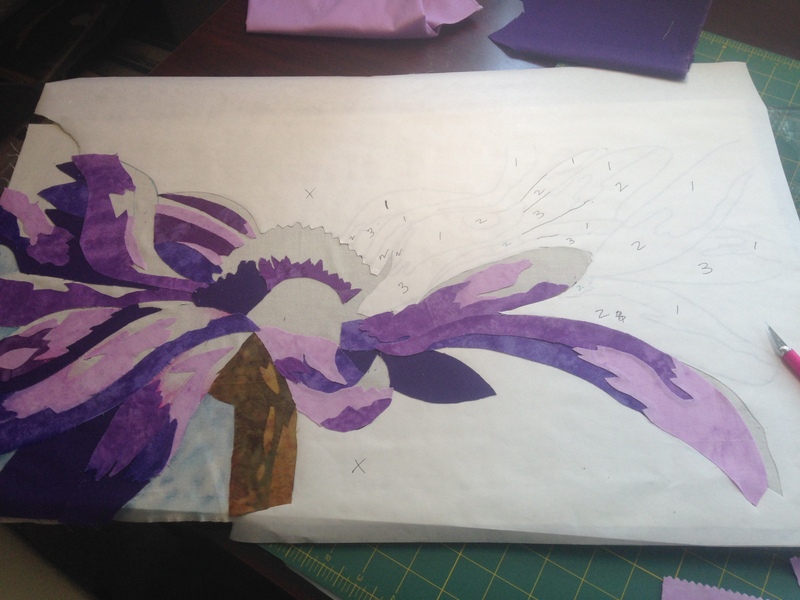 LOL After I have this portion done, I hang it up on the design wall and decide if I want any more detail added. Little bits here and there sometimes make a huge difference in the overall piece I think. 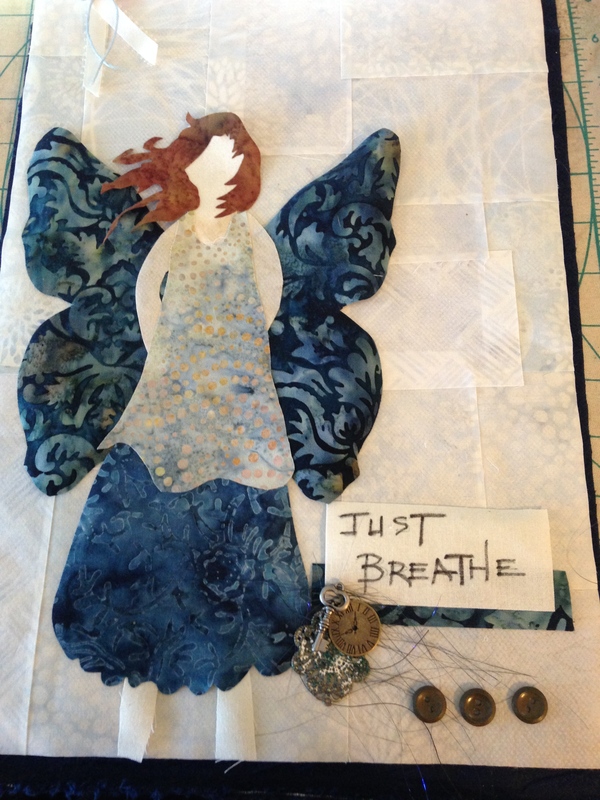 All put together here and ready for the thread sketching and quilting. 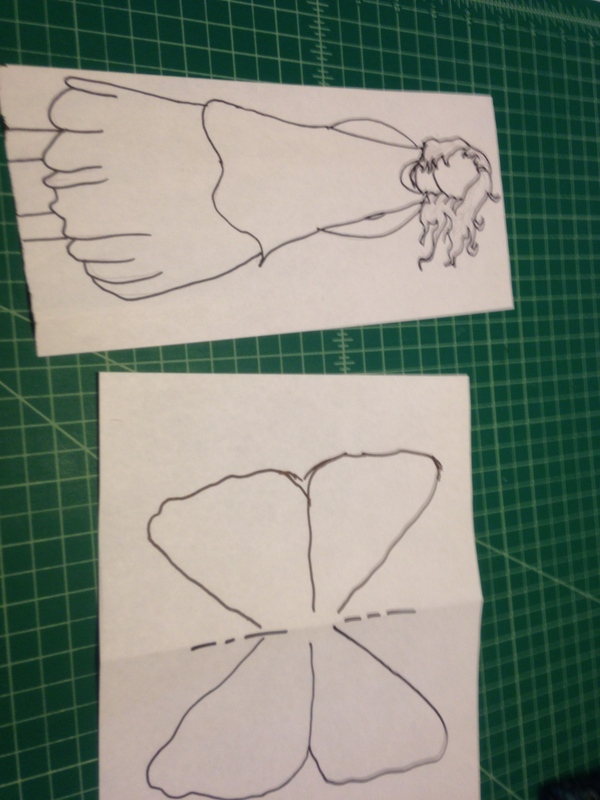 What a difference the thread sketching makes in my humble opinion. Looks so plain and simple at this point. 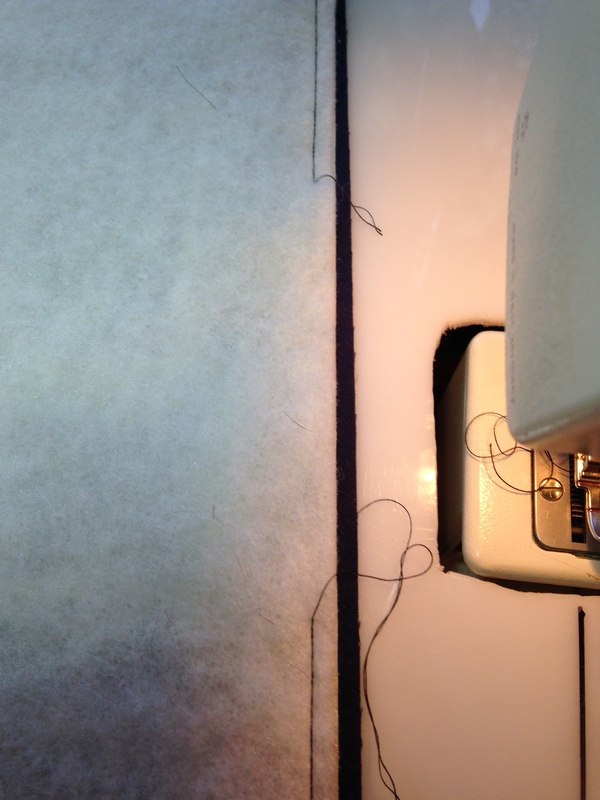 I don’t square it up until after all the sewing is completed. 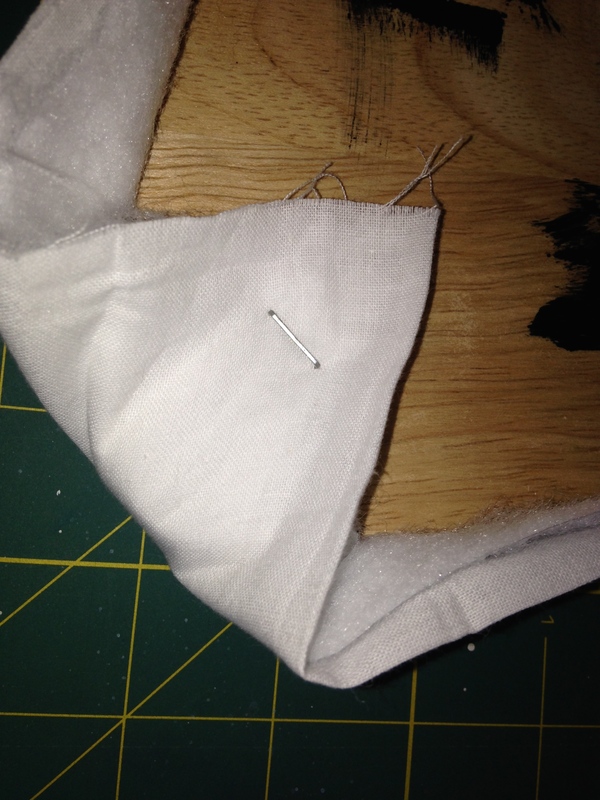 It will get a bit wonky during the process depending on how densely I sew different areas. 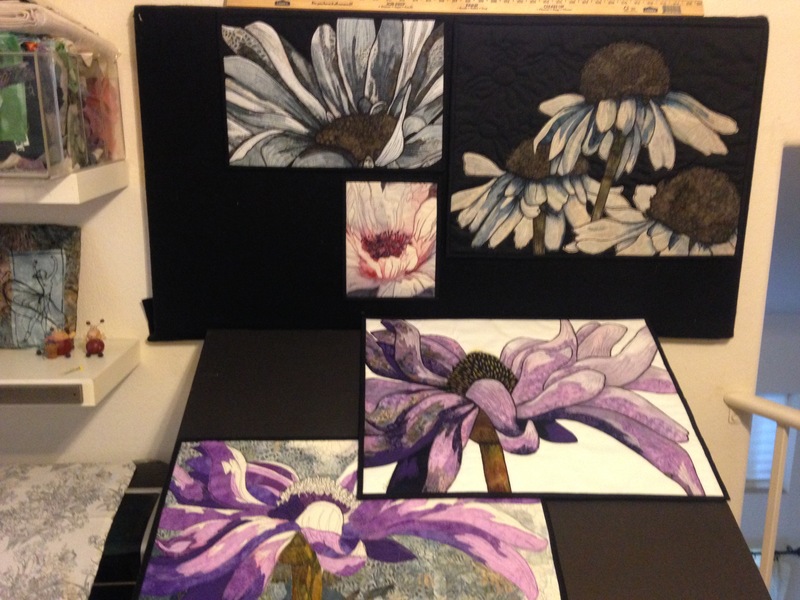 Hope you enjoyed seeing into my Studio and if you have any questions on anything, please feel free to ask. I’ll do my best to answer. 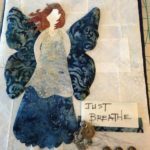 Do you art quilt? I’d love to see what you are up to also! So last January I decided that since my Grand-daughter Miss B is here 5 out of 7 nights a week usually, because her poor Mama had to be at work by 4am, she needed her own space and to get out of Kara’s old room and have her own room. 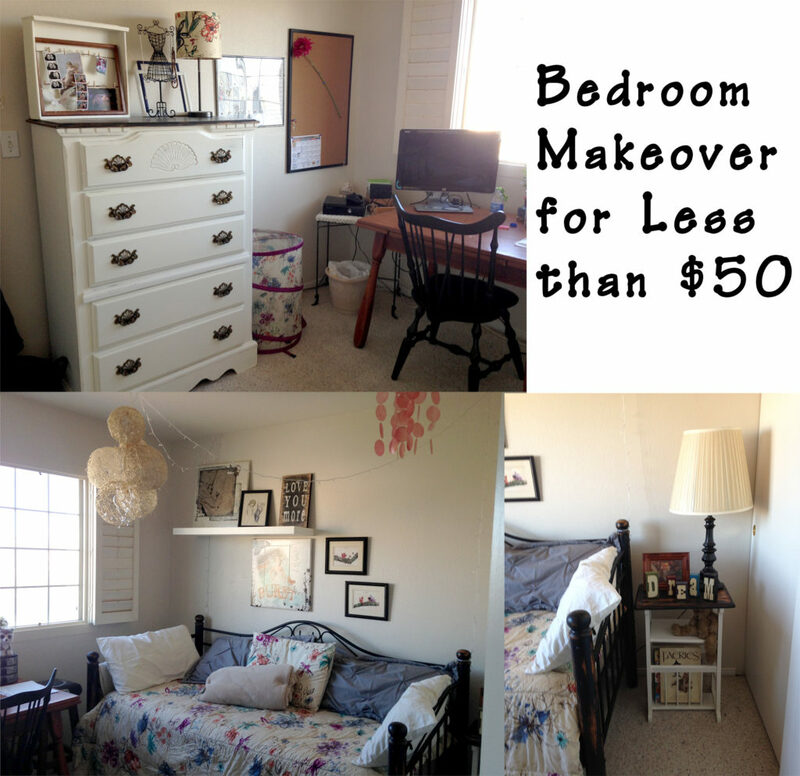 It was time to turn that spare bedroom back into a real bedroom. But I had to do it on a small budget. Like less than $50! 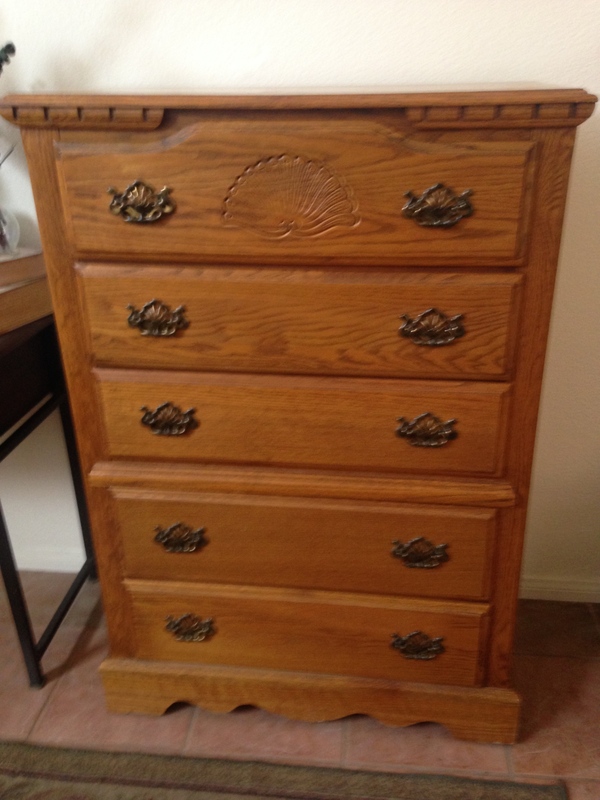 I found a solid wood dresser in the classifieds in my Neighborhood group on line for $10!!! Had some blemishes, but was in great condition. I had left over paint from previous year when I painted the room so decided to make chalk paint to use on the main part of the dresser. 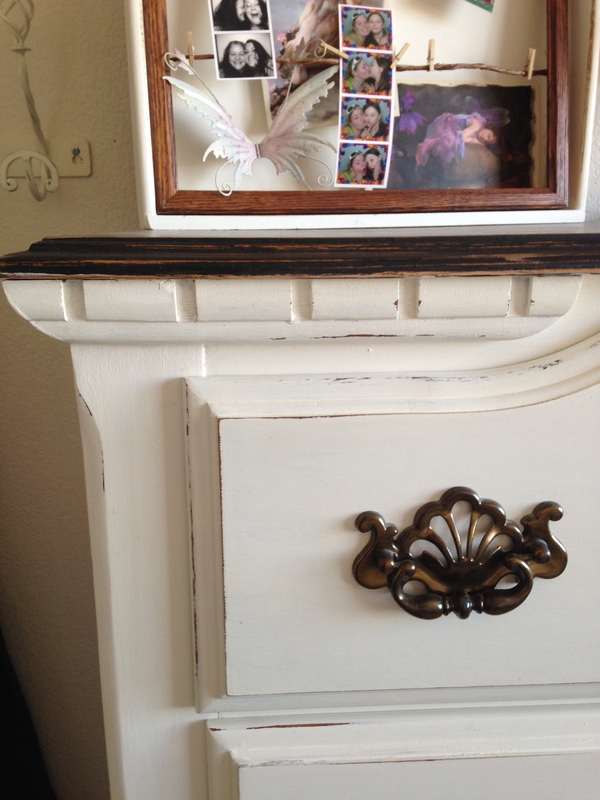 I wanted to finish the top in a worn wood look for accent. Sorry, wish I had taken photos of the process, but I’ll try and explain. 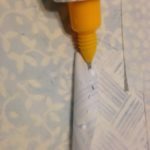 One way to make homemade chalk paint is to use 1 Cup Latex paint, 2 Tablespoons of non-sanded grout and a little water for mixing the grout. 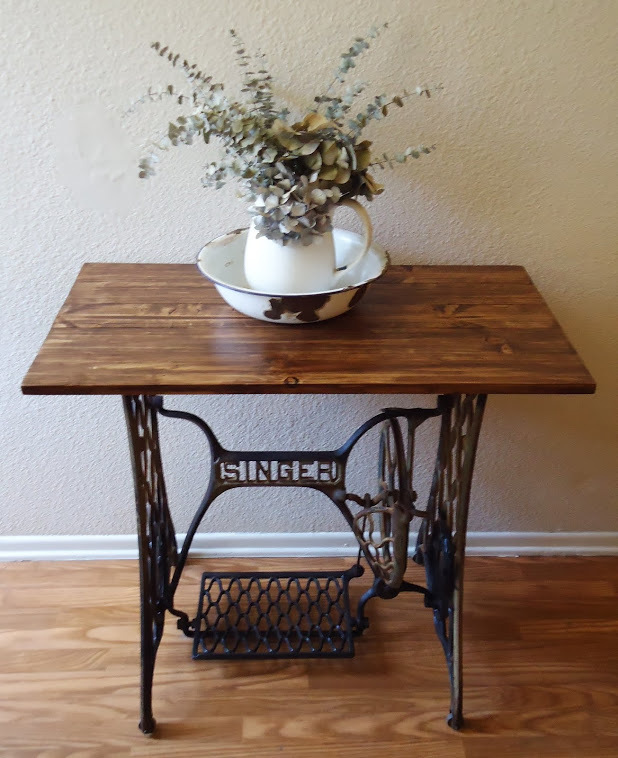 I used chalk paint because there is very little prep work involved. i.e. no sanding! I did use my hand sander on the top of course to take off the entire finish since I wanted to stain it a darker wood. 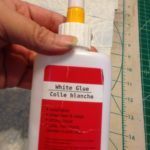 The only downside to using the grout over plaster of paris is it does have a little smell, not horrid, but there… and also it tends to clump up quickly and you need to add a little water and remix between coats. It also doesn’t keep well even in a sealed container so only mix what you will need. I didn’t have any Plaster of Paris so used what I had. 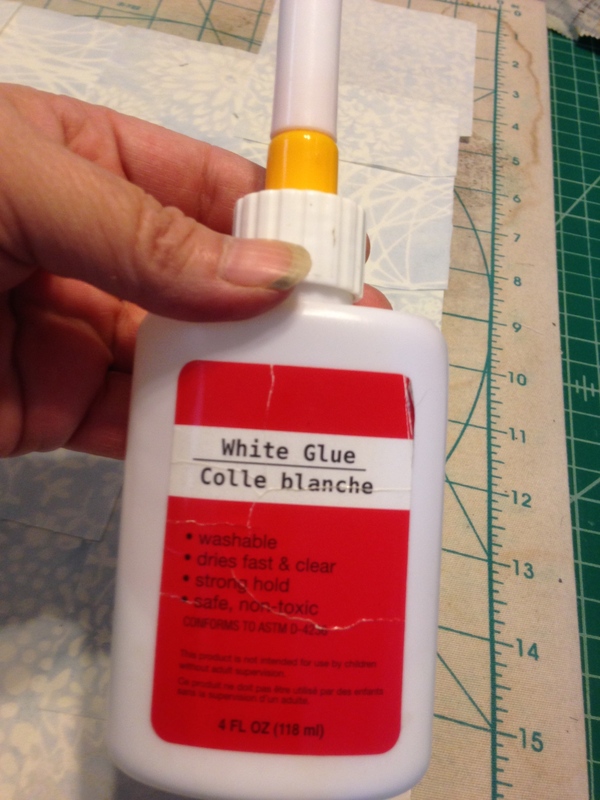 If you do your own chalk paint, I would recommend the plaster over the grout. The recipe is 3 parts latex paint to 1 part plaster of paris and water to mix. 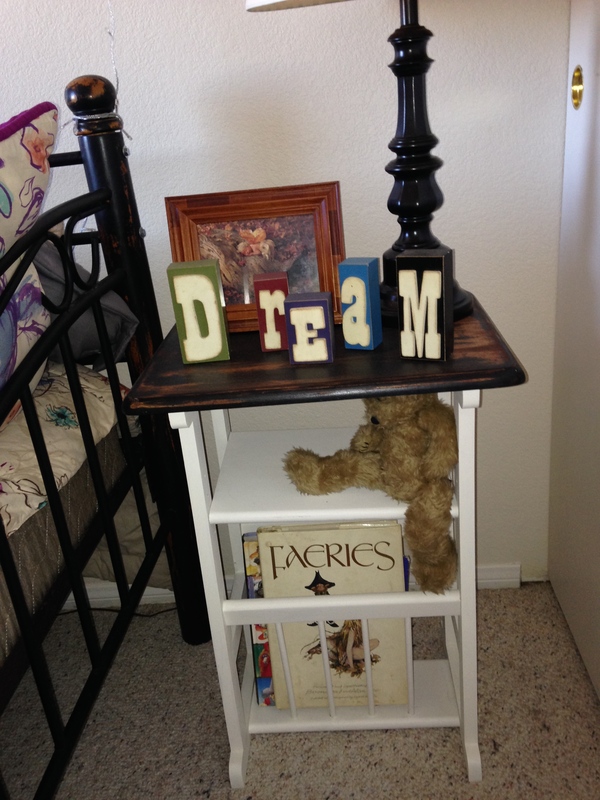 I used 2 coats on the dresser and also did a little night stand I had. Then I distressed it by sanding on edges to give it a country chic kind of look and to go better with the worn wood top I wanted to do. On the top I applied a mahogany stain, but applied heavier in some areas. I had the stain leftover from a previous project. 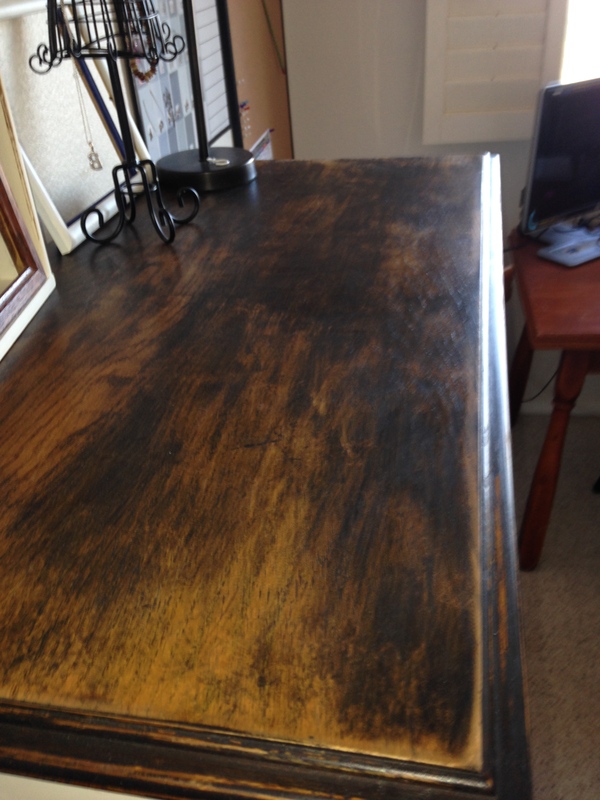 Then I watered down a little black craft acrylic paint and rubbed that on some of areas to make it look more aged. Used my sander once again and just touched a little of the edges for additional worn distressed look. I LOVE how it came out! I coated the entire dresser using a Wipe-on poly by Minwax because it seals it up with a gorgeous hand rubbed look like wax would give but so much easier. This came out so good I did the same to an old nightstand I had, a coat rack found in a garage sale for $1, and a left over drawer from an old broken dresser I use in the garage as shelves. LOL I also did the same worn wood technique on a Day Bed I found on Craig’s list for $20 and spray painted the metal a flat black metal paint. We did buy her a good new mattress though which I am not including in the makeover costs. And while in the garage, I found some old picture frames, painted them. 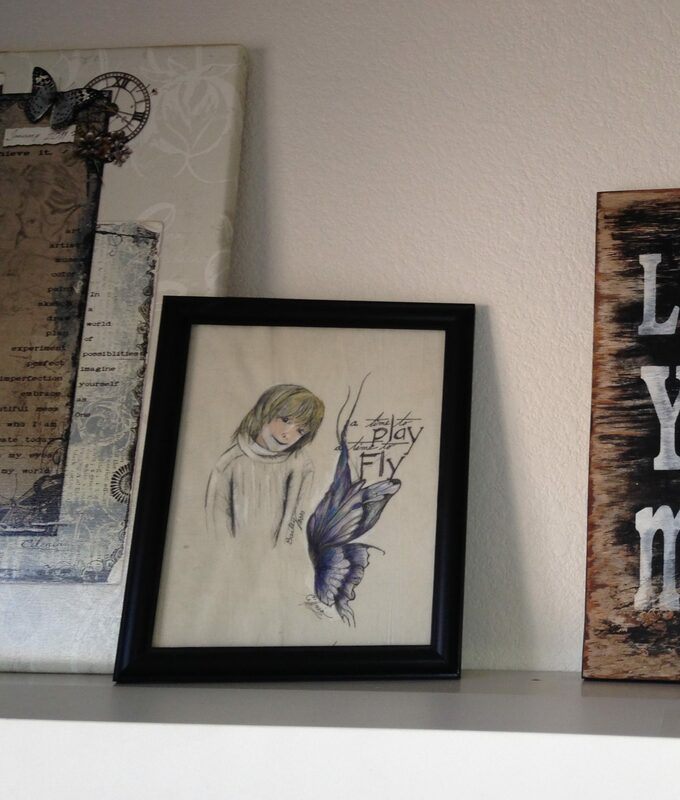 I put the fabric and ink art portrait I had made of Miss B and fairy wings in one, and stapled some twine inside one and used some mini clothes pins I had to hang photo booth photos of her and her Mom and Auntie and placed this in the drawer on her dresser. 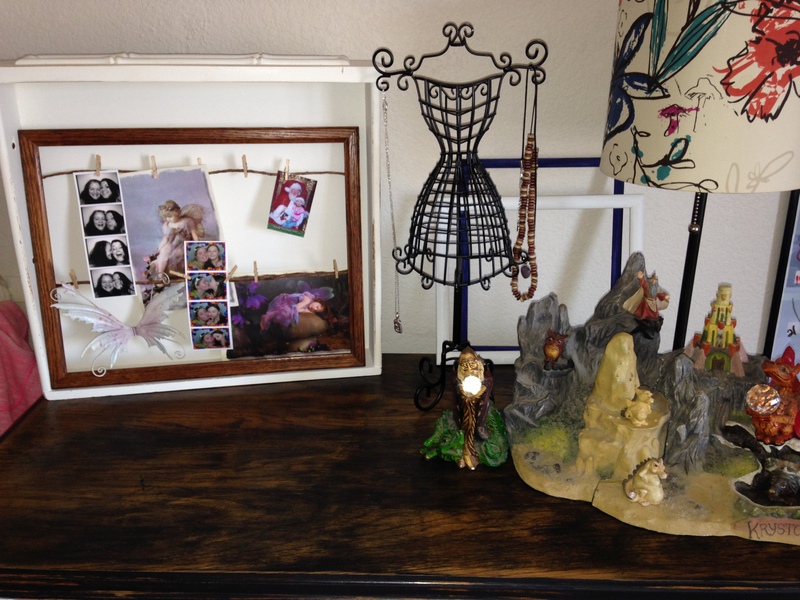 Then I just added the others on top of her dresser just for fun. Found a set of wings left over from a fairy that had broken years ago and put them in the drawer too. (No I’m not a hoarder, just couldn’t throw them away.) And had an old brass lamp that I repainted to match the metal on the day bed, some post cards of fairies that I put into frames too. 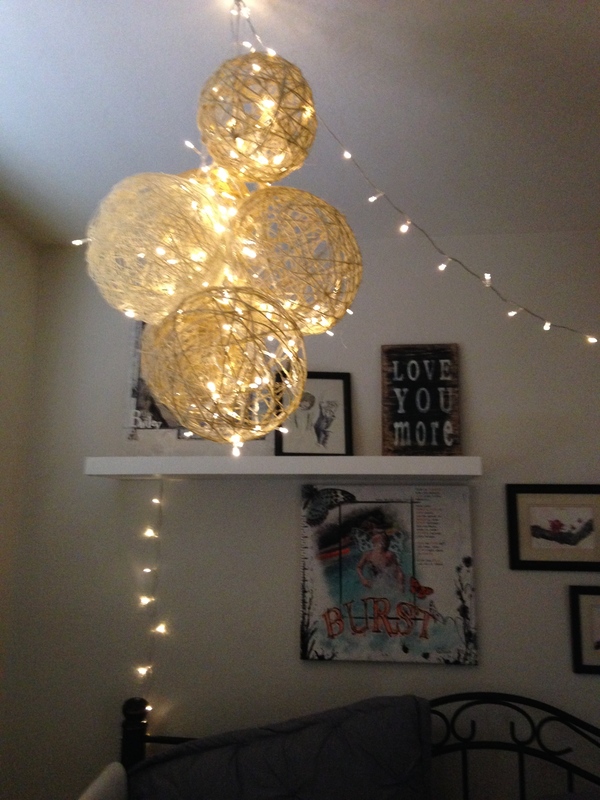 And that gave me the idea of making the twine balls chandler and putting fairy lights draped to and in it. I learned how to make that from a Pin I found on Pinterest HERE. I did this with Miss Bailey and her Mama and we had a blast getting all sticky. LOL Found the Fairy Lights for a killer deal on Amazon for $11. They even have different settings like fading twinkling etc. B loves them and gives her more light in the room too. 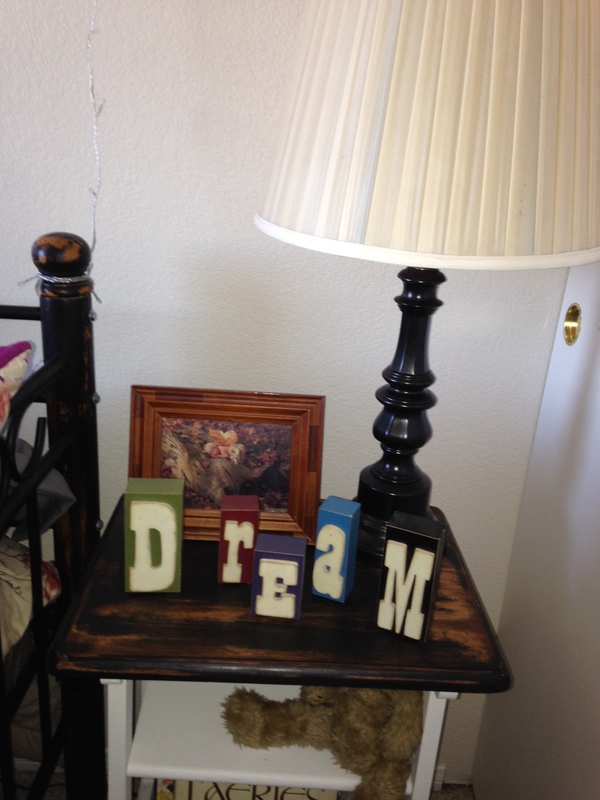 Also had some old wood pieces out there and made the “Love you More” sign using a stencil I made with my Brother Cutter and craft paint and bought some wood letters from local craft store and glued to painted blocks for the “Dream” blocks on her night stand. 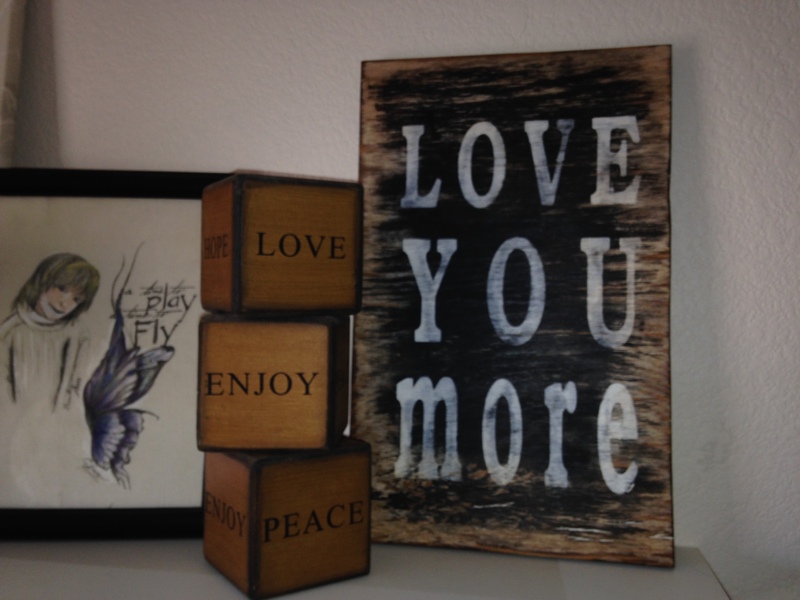 Cut up and sanded some blocks and stained and distressed the edges with watered down black paint and put some inspirational words on them and stacked on her wall shelf. I found the floating shelf in a garage sale too for $5. Also found a poster frame I had never used… had a bunch of various blue paint store samples so I cut them all to one size and glued them to construction paper and put into the frame to make a calendar. 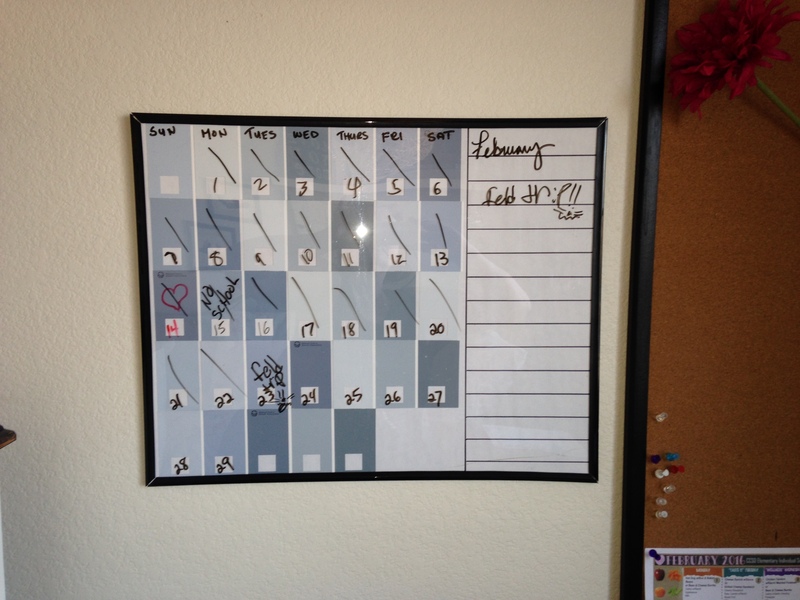 Then I used a dry erase marker to put the month and days. OH and an old planter and wicker side table too! 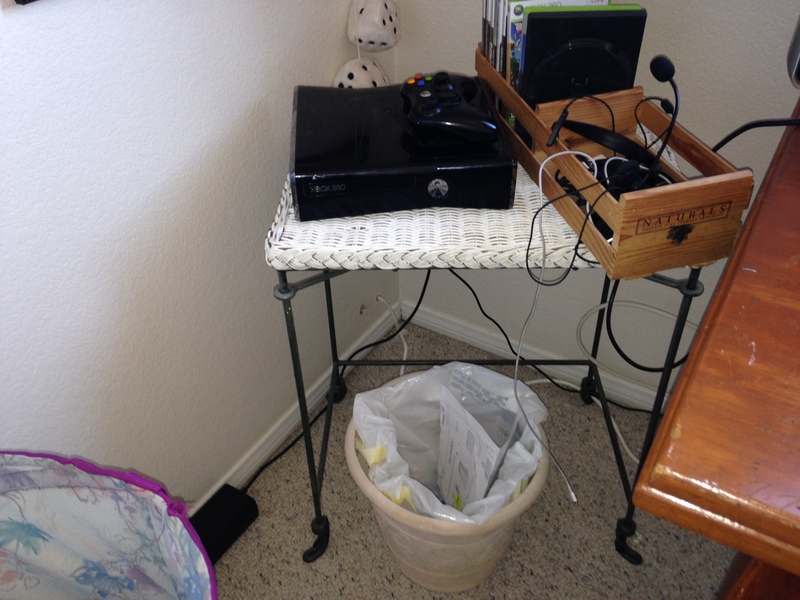 Used the planter as her trash bin and the side table I repainted same as everything else to hold her x-box and another garage sale find of a $1 wood crate to hold all her game discs. Found a cork board in the garage too left over from one of the kids. Painted the frame black to match better. 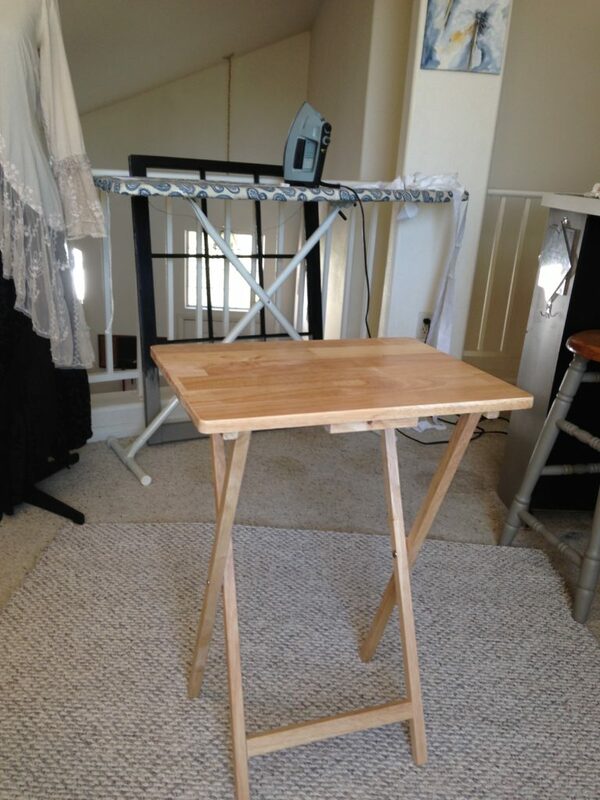 The wood table was my great-grandmother’s sewing table so I choose not to paint it being a family heirloom. I did paint an old wood chair I had black previously so it fit in well. She could use those for a desk. Had my old flat screen monitor in the garage from before I bought my Mac so now she can use that with her lap top and her x-box. One day when they get a house near by and she is a little older to stay home alone, I told her she can take it all to her new house if she wants. But for now, she has her private space and a room she can call her own when she is here with us. 🙂 Here are some photos I took. You can click on them to see full size if you like. If you have any questions on something I made, please feel free to ask. I’ll do my best to explain better.